A thin but long, high density (Tungsten) dart with a high muzzle velocity and little speed loss, giving a near instantaneous time-on-target. Due to the high flight speed, the round does not carry any guidance. The MAPHE-SG is an anti-air artillery shell, with a warhead based on designs from the late 20th century. The shell incorporates a Lidar sensor and guides itself to the vicinity of the target, then fires four darts in an optimized firing pattern that virtually insures at least a 75% hit rate. These darts explode after penetrating the armor, destroying large parts of the internal structure of lightly armored targets, and large chunks of armor from heavier armored targets. This shell has a proximity fuse to explode above troop concentrations and releases hundreds of hypervelocity darts. Especially effective against body armor and light APCs, the effectiveness of this round is diminished by cover such as buildings. The round has some secondary capability against helicopters and other low and slow flying targets. This round will impact on a target, crush the thin plating of the round and smear the plastic explosive inside over the armor of the target. A base fuse will detonate the plastic, causing a scab of armor to shatter. The shell is variable fused, and can be used as a general-purpose High Explosive shell. 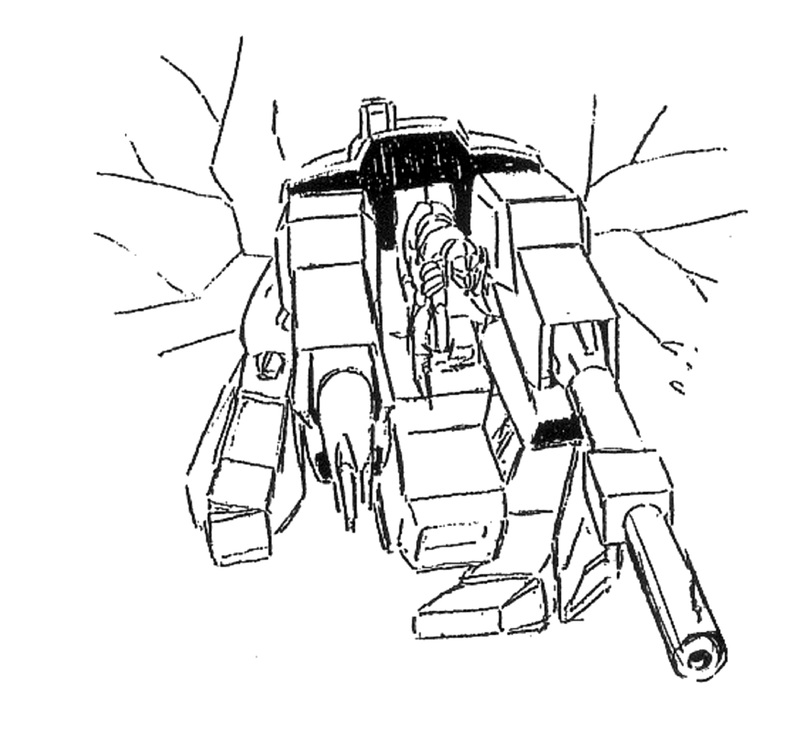 With impact fuse this shell is especially effective against Zentraedi battlepods. Delivers a seismic/passive EM sensor and radio link to an area. Can stay active for two months. Smoke and illumination/white phosphorus rounds are also available. 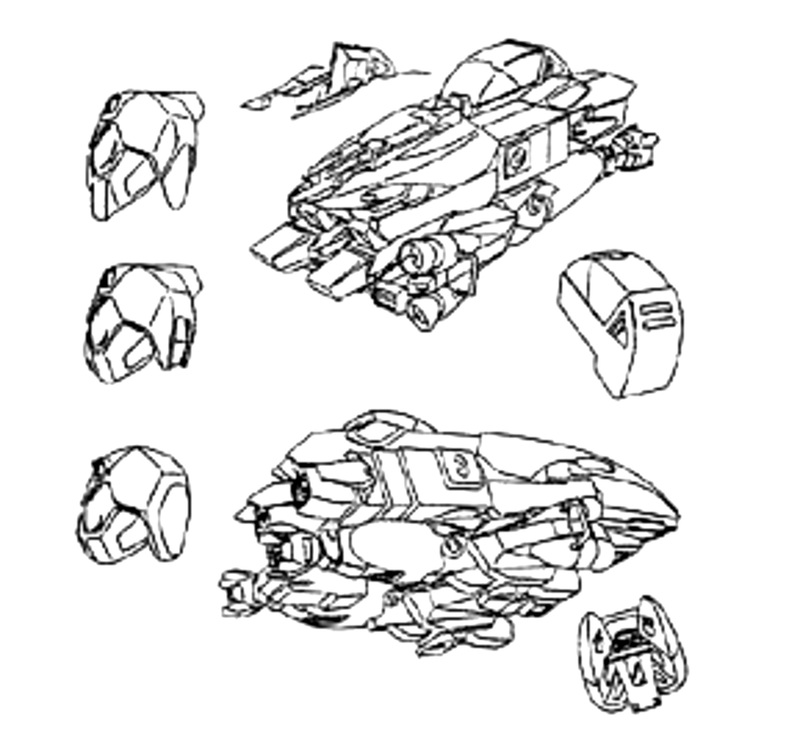 Late in the Second Robotech War a plasma shell was developed as replacement for the HESH and MPAF shells, but only a few thousand of this version were produced before the SC fell to the Invid. It was a most impressive round, releasing 30 MJ of thermal energy on impact. A boosted tactical nuclear device, available only through direct order of the SC High Command, with a yield of 1 kiloton. This shell is a special weapons round, available only through direct orders of the Southern Cross Division General or his superiors. McDonnell Douglas VHT-1A1 Spartas Veritech Hover Tank, with crew showed for scale. McDonnell Douglas VHT-1 Spartas Veritech Hover Tank with Lockheed AJP-01 Battloid Jump Pack. 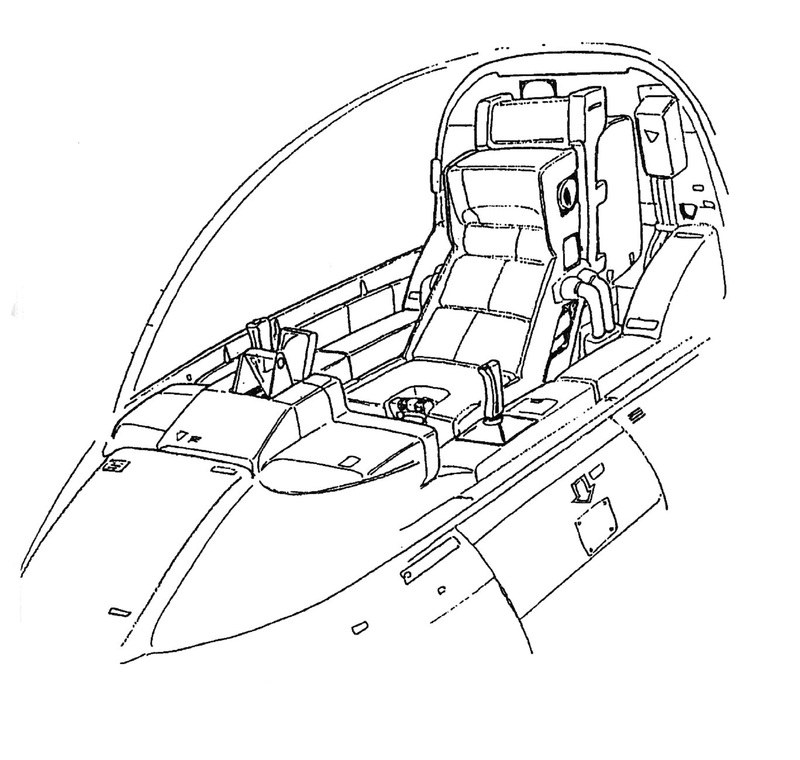 McDonnell Douglas VHT-1A2 Spartas Veritech Hover Tank technical illustrations. McDonnell Douglas VHT-1 Spartas Veritech Hover Tank crew compartment. 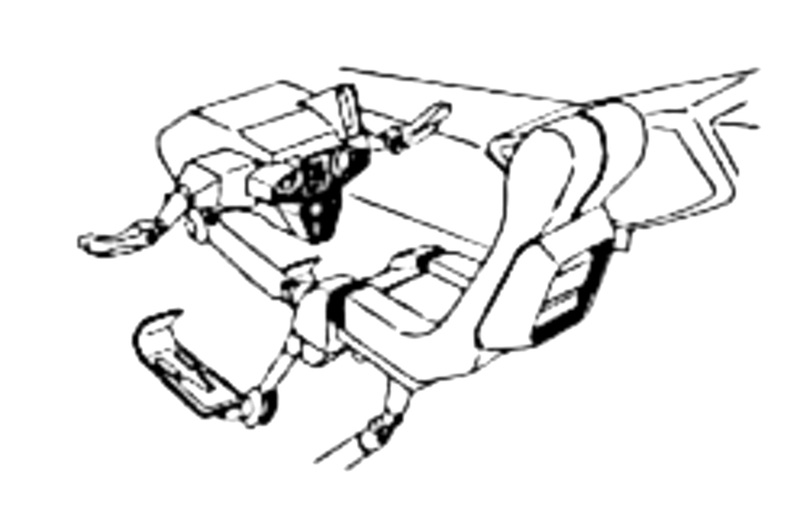 Trainee seat, when installed on a VHT-1A1. This seat allowed for a student operator to ride along with an instructor. Though transformation to Battloid mode was possible, space was tight to say the least. Cockpit area whilst in Battloid mode on the VHT-1A2/A3 models. McDonnell Douglas VHT-1 Spartas Veritech Hover Tank head details. 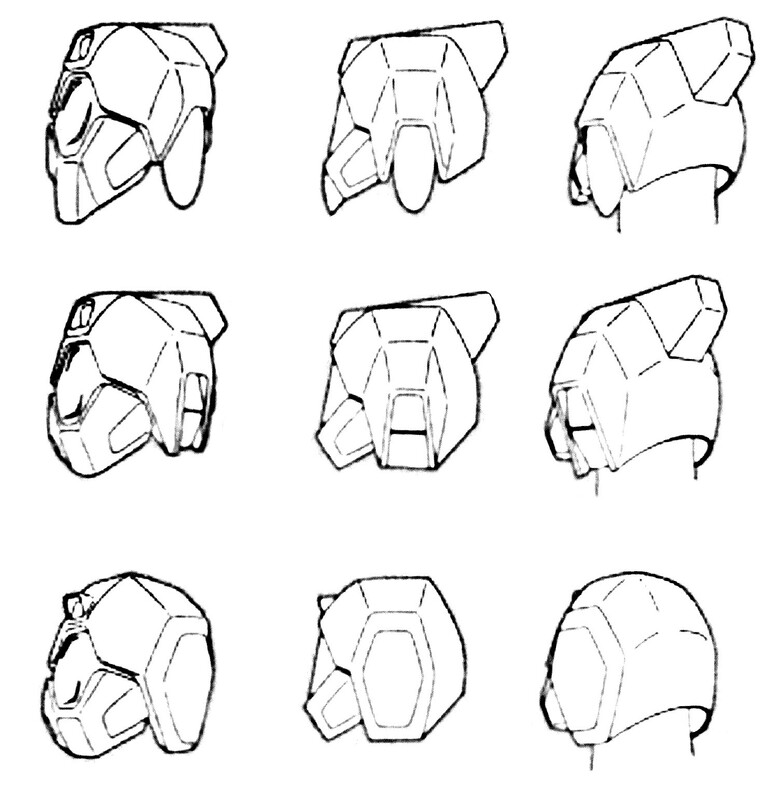 VHT-1 head styles, corresponding to crewman ranks. The full designation of a Spartas model included an A, J or S designation, as was the tradition since the original VF-1 Valkyrie, though these full designations were rarely used in practice. From top to bottom, the full designation for a VHT-1A1 with these differing head styles would be VHT-1SA1, VHT-JA1 and VHT-1AA1. 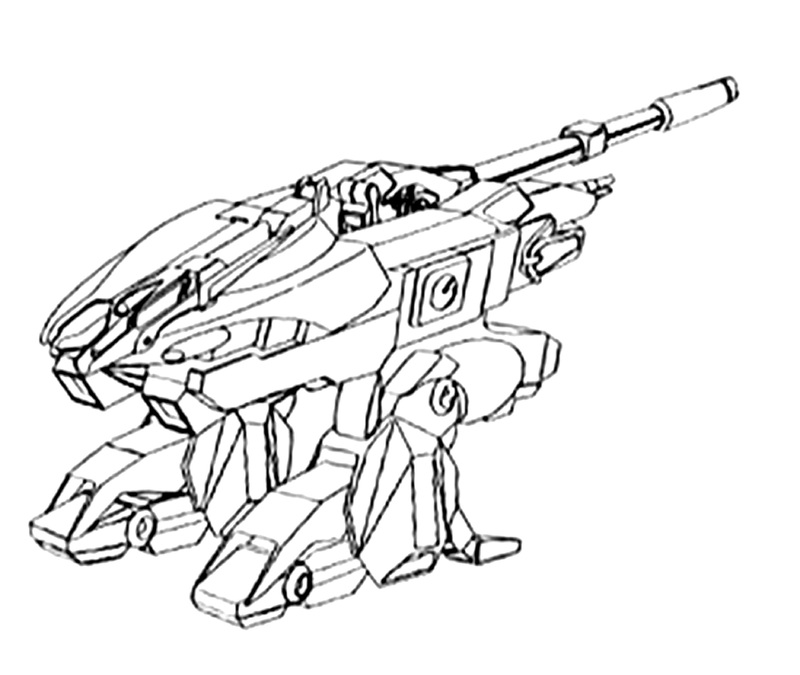 Example of a one-off modification of a VHT-1S, used during an awards ceremony during the Second Robotech War. 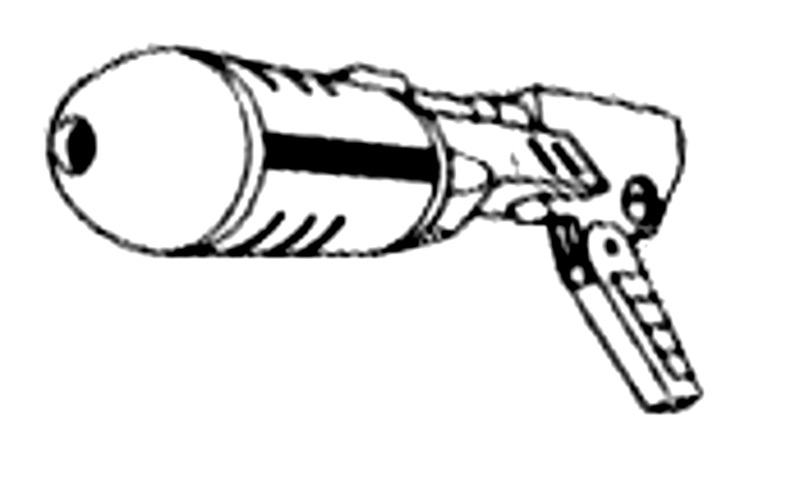 Mauser EU-11 28mm Laser Gun Pod. McDonnell Douglas VHT-1 Spartas Veritech Hover Tank in action. VHT-1 Spartas during the invasion of Tirol. VHT-1A3 Spartas on Earth during the Invid Occupation. 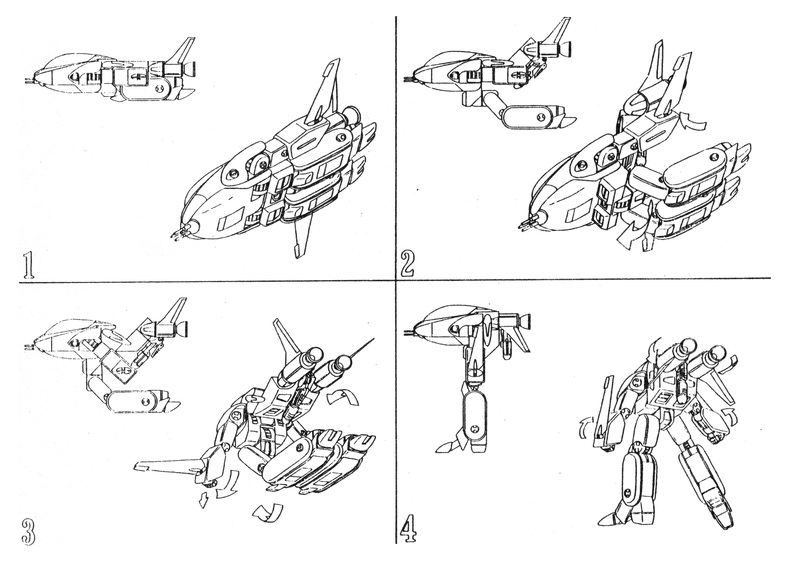 McDonnell Douglas VHT-1 Spartas Veritech Hover Tank transformation sequence. McDonnell Douglas VHT-1 Spartas Veritech Hover Tank. Design: McDonnell Douglas Land Systems. Builder: McDonnell Douglas Land Systems, Kraus Maffei Destroids GmbH. 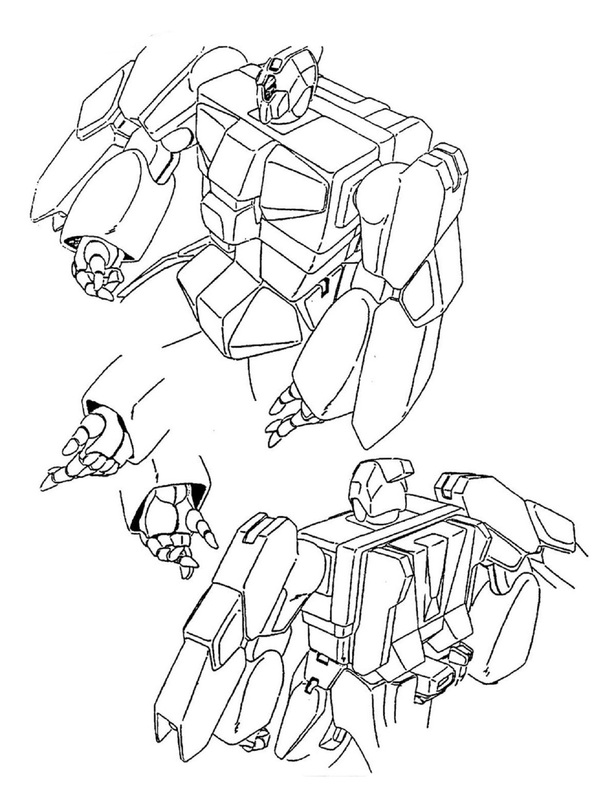 Type: One person, all weather, three form Veritech scout mecha. VH-X Eurotas: Veritech Hovertank test bed, developed by McDonnell Douglas Land Systems, tested from 2011 to 2013. VHT-1: Served with the United Earth Defense Force’s (UEDF’s) Tactical Armored Cavalry (TAC) from 2019 until 2033, and with the Reconnaissance Expeditionary Force/United Earth Expeditionary Force (REF/UEDF) from 2020 until 2040, when it was retired from service. VHT-1A1: Served with the UEDF-TAC from 2028 until the Invid invasion. VHT-1A2: Served with the UEDF-TAC from 2031 until the Invid invasion. VHT-1A3: Served with the UEDF-TAC from 2031 until the Invid invasion. 4 x P&W HJ-800 hover jets, max. output 71 kN of ground-effect thrust each. Peak hovering performance at 1 meter altitude. Multiple gyroscopes for stability and attitude adjustment in zero gees. 8 Standard Canisters of Protoculture. 1 x Lockheed AJP-01 Airborne Jump Pack with two TurboUnion main thrusters producing 68 kN of thrust, two small horizontal thrusters and four maneuvering winglets. 2 x TurboUnion RP-2S rocket pods, attached to the leg-mounted hover jets. Max. thrust, 103 kN ea, for up to 70 seconds. 2 x TurboUnion OMS-2 with two steerable xenon fueled gridded ion thrusters producing 215 kN of thrust each, with a total Delta-V of 0.9 kps. Note: In airborne operations, the VHT-1 mounts the AJP-01 and RP-2S pods. This allows the Spartas to be dropped from altitudes up to 7,000 meters. In spaceborne operations the VHT-1 mounts the RP-2S pods and OMS-2 thrusters. This system was typically used for anti-ship boarding parties. Max speed : 112 kph. Typical cell endurance: 200 hours continuous use. Phillips AllView II multi-band digital spherical camera system, for medium range all attitude infra-red imaging, optical and ultra-violet band detection and tracking in Battloid mode. Thomson LT-8 multi-frequency laser ranger and designator. Selenia GroundWarrior active/passive sensor jammers. 1 x Rheinmetall MCR-68A1 105mm liquid-propelled smoothbore cannon, extending from the arm-shield in Tank mode. It may be used in Battloid mode, though it is rather unwieldy. The ammunition feed is automatic, sustaining a rate of 25 rounds/minute, or even faster for short periods. 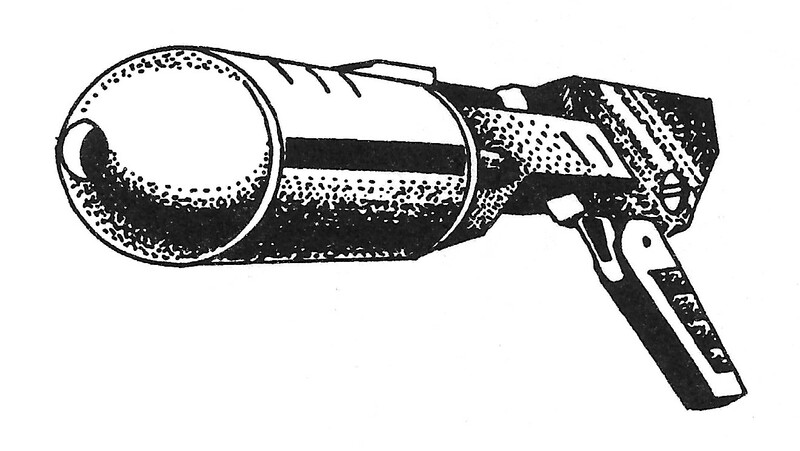 The cannon arm stores up to 30 shells without reload, and another 30 can be stored in the other arm-shield, but must be reloaded by hand. Enough liquid propellant is carried for 65 shots. The mix of shells is mission-dependent, but a typical anti-mecha load-out is 30 FSDS-TU, 10 HESH, 10 MPAF, 5 MAPHE-SG and 5 Smoke rounds. See the addendum for full shell listings. The maximum effective direct-fire range is 5.6 km for the FSDS-TU round, and slightly less for the HESH round. 1 x RRG HPW-125A1 125mm particle cannon, extending from the arm-shield in Tank mode. It may be used in Battloid mode, though it is unwieldy in the extreme. The weapon is capable of firing salvos of 22MJ maximum yield at a rate of 30 shots/minute at this maximum yield. The typical maximum range is 4.2 km, and indirect fire is not possible. 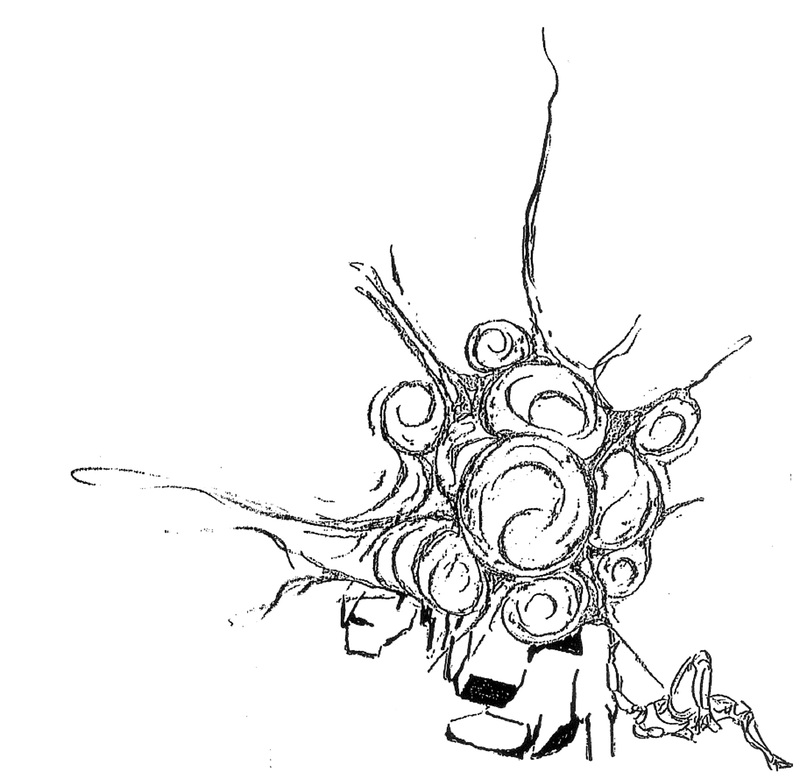 The weapon uses 8 dedicated protoculture cells to generate the power required to charge the capacitors. 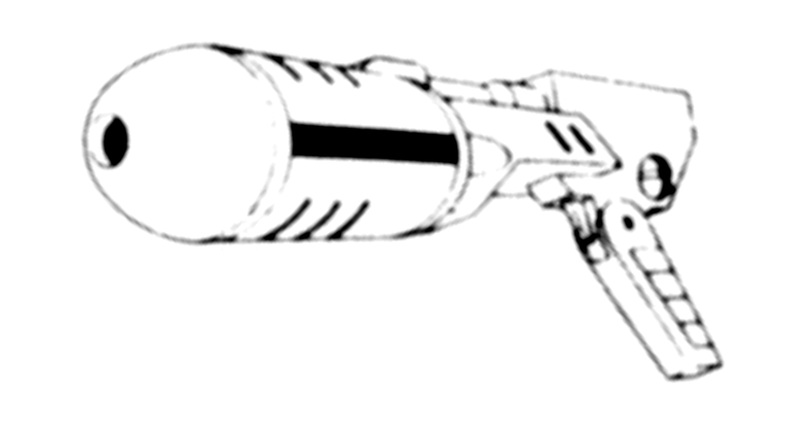 1 x Mauser EU-11 28mm Laser Gun Pod (front-mounted in Hovercraft mode, hand-held in Battloid mode). This gun pod fires laser pulses of up to 12.5 MJ energy per blast. The pod can fire up to 110 pulses/minute. 1 x Oerlikon MIW-20 triple-barrel 20mm Ion Pulse Cannon (arm mounted, used mainly in Tank mode, though available in Battloid as well). 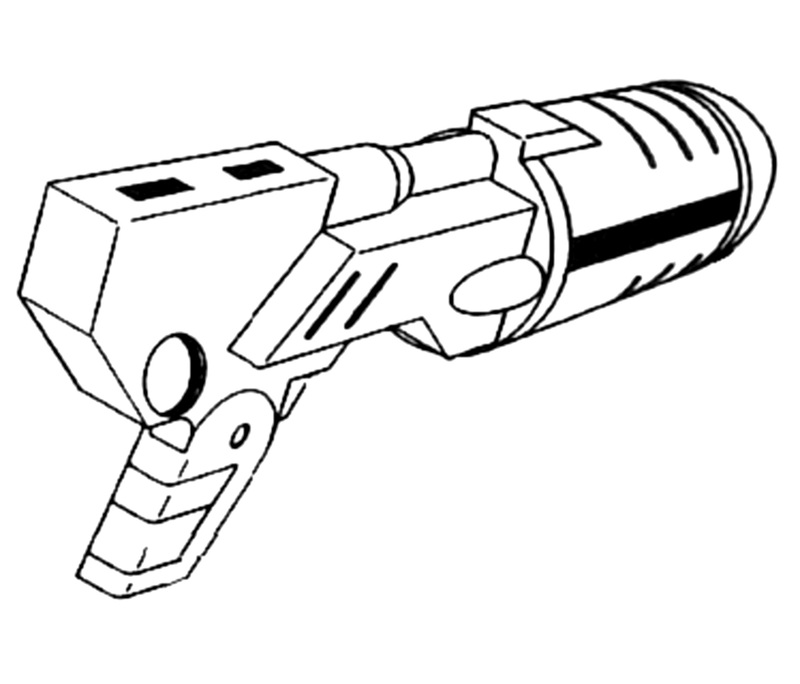 The weapon fires bursts of plasma annihilation discs, the typical energy expended in a burst is 5 MJ. Enough energy for ten bursts is stored in a capaciter, and the mecha can generate 20 seconds worth of sustained fire per minute. 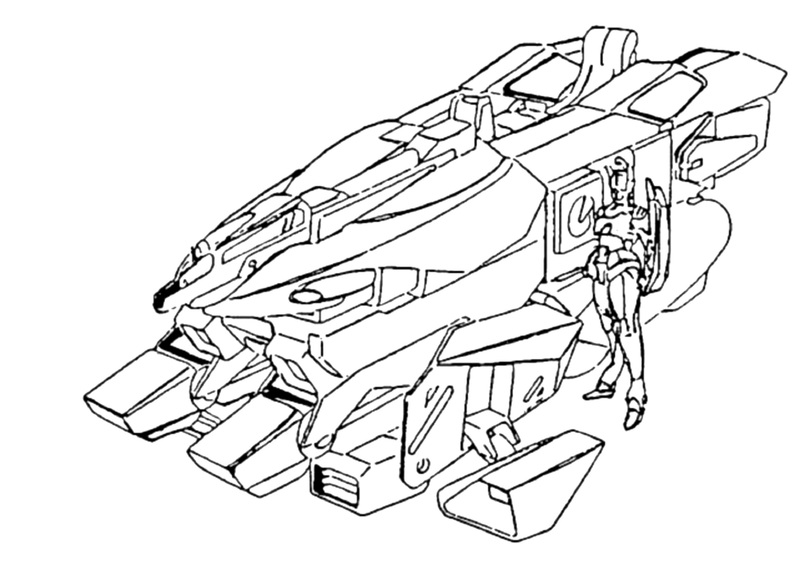 The cannon is powered directly from the protoculture cells of the vehicle. 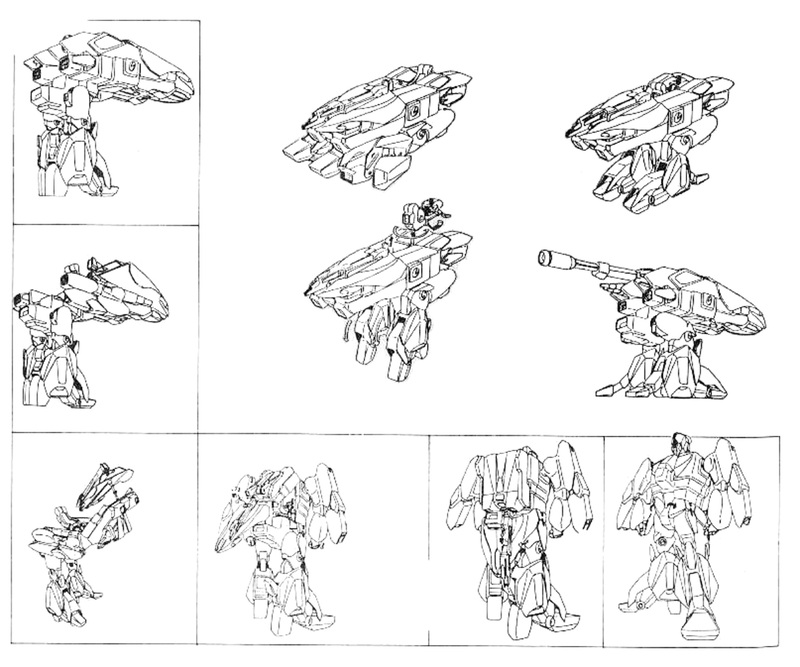 The armor on the Hover Tank is a new development in low-mass composite-materials Chobham plating that became the standard for all Terran mecha after its application to the VQ-6A Vandal. Aside from the respectable protection provided against projectiles, missiles, and other kinetic weapons, this armor is also resistant to plasma globes (annihilation discs), lasers, and to a lesser extent, particle guns. This is owing to the fact that the armor can flake off and evaporate in layers under fire from such high-energy weapons, taking much of the weapon’s energy and converting it into the latent heat of sublimation in the armor. 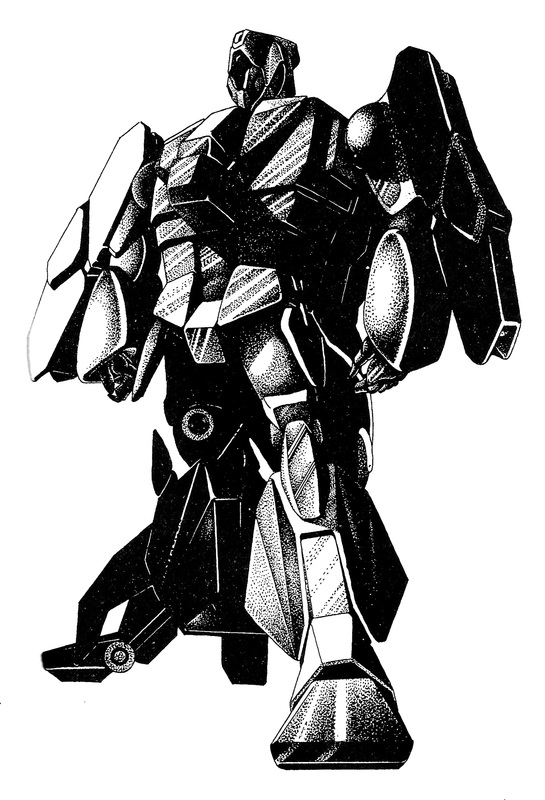 The armor stops all small arms, heavy infantry weapons fire, and light mecha-mounted weaponry, and provides good resistance to medium mecha-mounted weaponry, such as the Valkyrie’s 55mm APFSDS round, and poor resistance to heavy mecha-mounted weaponry, such as the VHT’s 105mm smoothbore shells. 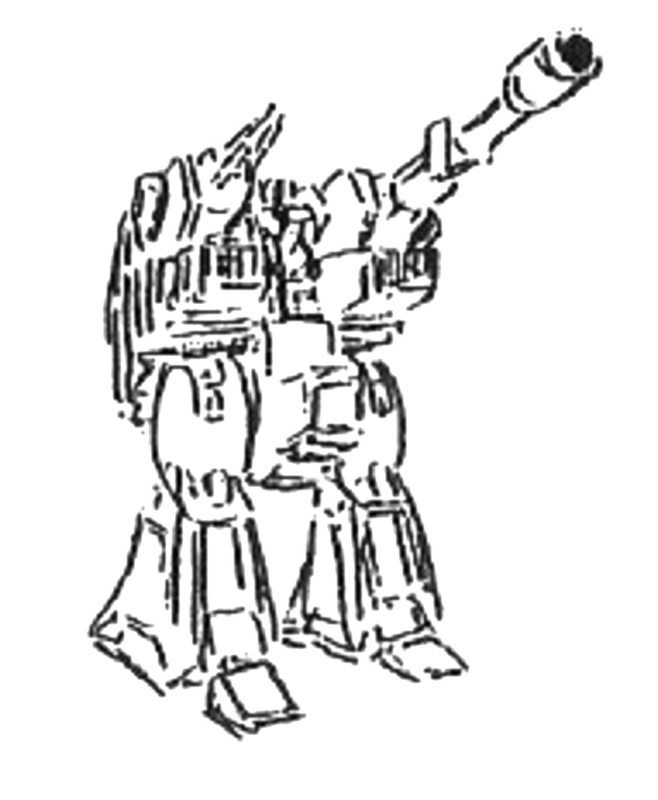 The main cannon and tri-cannon are mounted in armored housings on arms that have a thicker armor, and are often used to parry incoming fire. Here the armor resistance is better than that of almost any other mecha, except the HWR series Destroid. The armored pilot compartment is proof against all shrapnel and environmental hazards, but can not withstand any strikes by shells (at non-perpendicular angles) larger than 30mm. Unfortunately, severe performance and reliability problems with the VR systems caused the pilot compartment to be removed from the tanks, even in combat. When equipped with the armored pilot compartment, the VHT provides full protection from nuclear, biological, and chemical hazards, using an overpressure cockpit environment activated by radiation and hazardous chemical sensors, or manually when biological warfare conditions are anticipated. The internal consumables supplies can provide atmosphere for eight hours maximum. The Hovertank was developed in response to a 2009 request for proposal by the UN Spacy for a new ground-effect scout vehicle to replace the M12 Centaur Veritech light tank then in service. 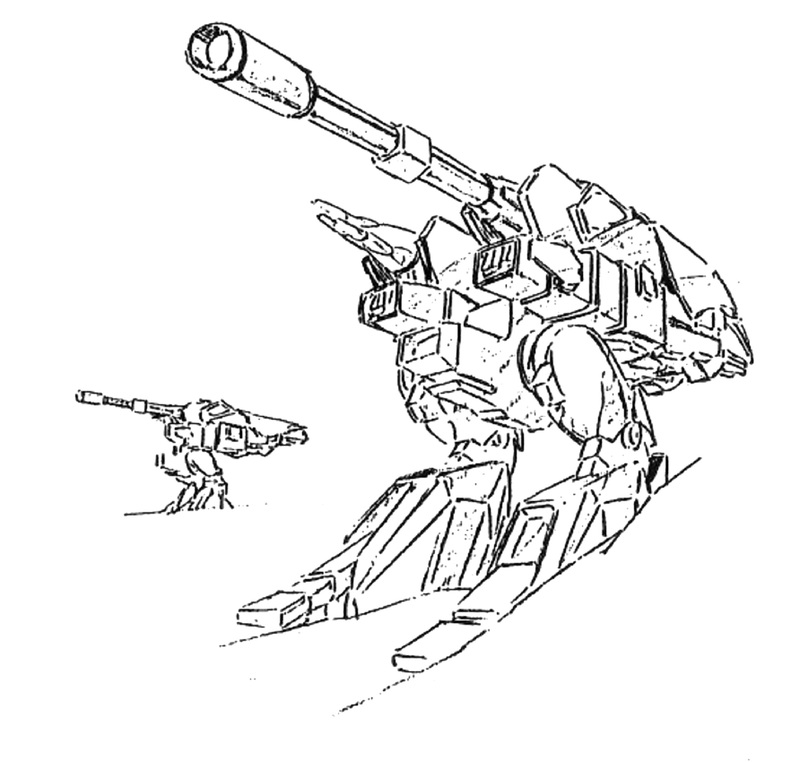 The acquisitions department drew up the specifications for a scout mecha with far superior mobility over the Centaur, but also with the firepower to engage any Zentraedi mecha, or even mecha more heavily armored than those of the Zentraedi. The latter was drawn with one eye to the internal politics of the Earth itself, and the VHT was from the outset intended to be capable of dispatching all Terran tanks and other fighting vehicles. 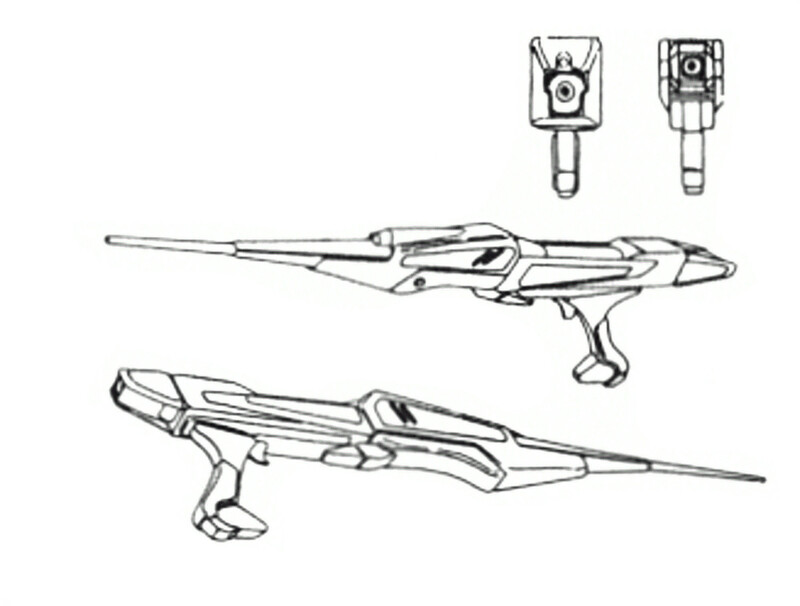 In addition, the design was to have an alternate form to engage in close in combat. From the contestants, two designs were chosen in 2011 for prototype building and performance evaluation. These two were McDonnell Douglas’s VH-X Eurotas and the Vickers plc Centaur II, a heavier development of the old M12 Centaur. McDonnell Douglas took the lead in this competition because of the superior mobility and reduced crew requirements. 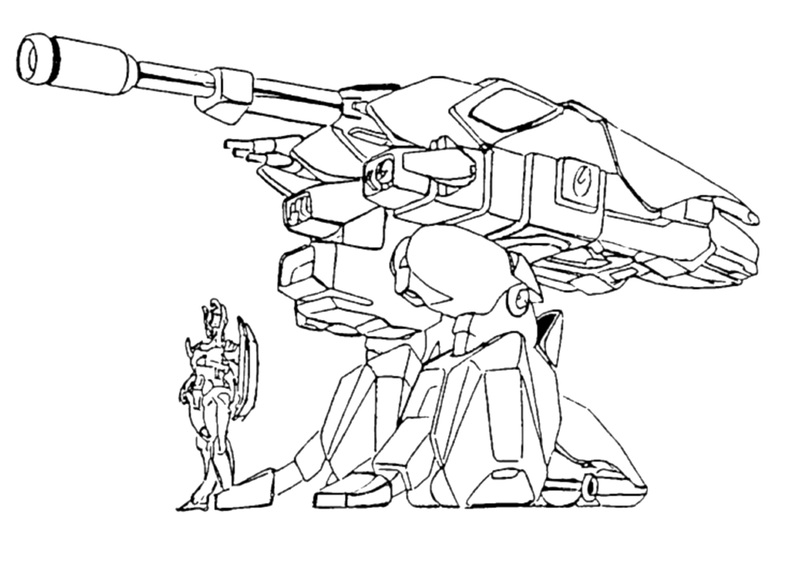 (the Centaur II remained a two-man mecha). In addition, the 105mm high velocity cannon of the VHT-1 proved to be a far superior weapon to the complex 152mm rocket/shell cannon on the Centaur II. More importantly, it was also far more reliable and easier to maintain. The main drawback was what were termed ‘teething problems’ with the armored compartment that protected the pilot. The electronics that created a virtual reality of the surroundings on the inside of the hood were decidedly sub-par, to the point that most of the test program was run with the compartment removed and the pilot exposed. Consequently, in 2017, after a protracted low rate initial production period (during which the project repeatedly shifted up and down in priorities due to the demands on funds, personnel and material caused by the Malcontent Uprisings), the VHT-1 Spartas entered operational service, with full rate production following in 2019. 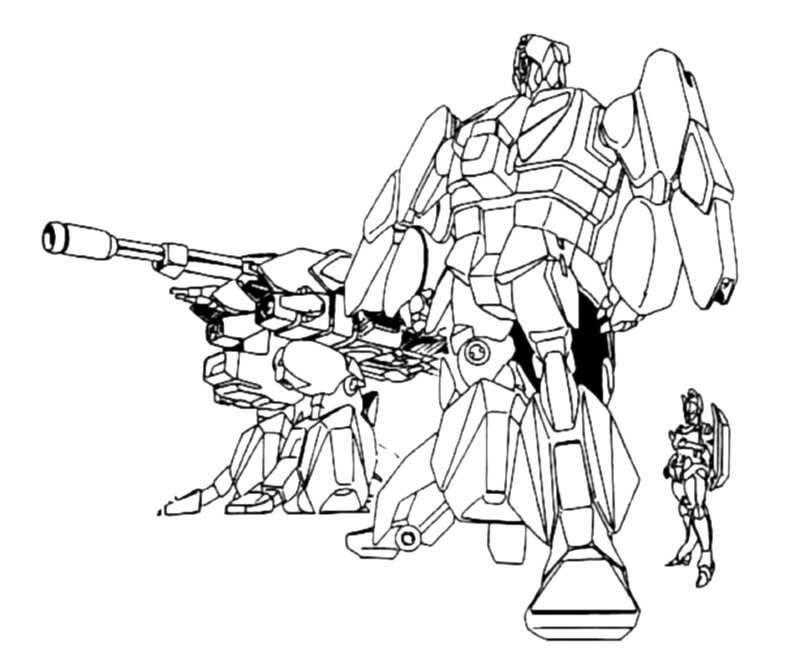 The vast majority of procurements of this mecha were by the United Earth Defense Force’s (UEDF’s) Tactical Armored Cavalry (TAC). 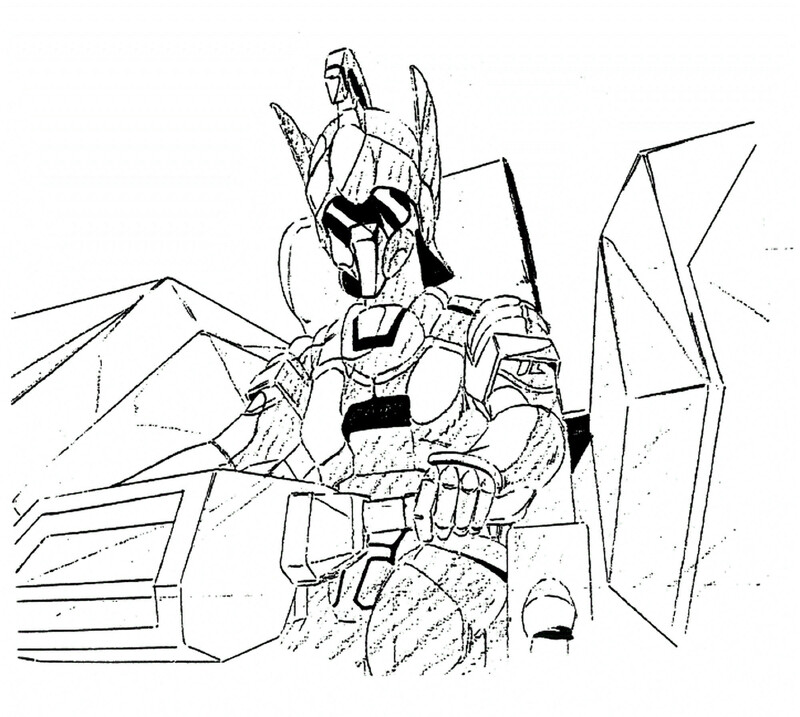 Several thousands of VHT-1 were produced before and during the Second Robotech War, but their drivers were somewhat apprehensive about their mecha, for it was a victim of mission creep during the late 2020’s. 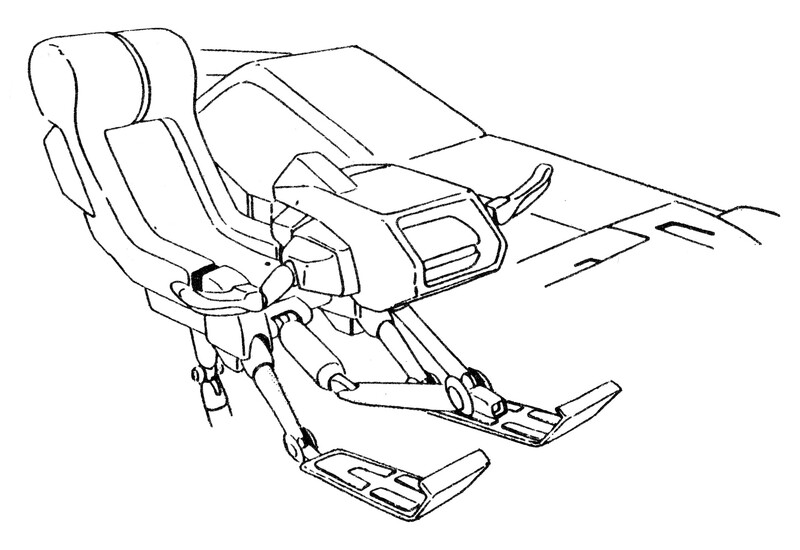 In addition to their designed scout role, the VHT-1 was later designated to be part of the fast-reaction forces, and to be among the first mecha to engage alien landings. Far worse, however, were the ‘teething problems’ with the pilot compartments which remained unsolved due to limited funding, bureaucratic inertia and numerous audits and policy reviews. 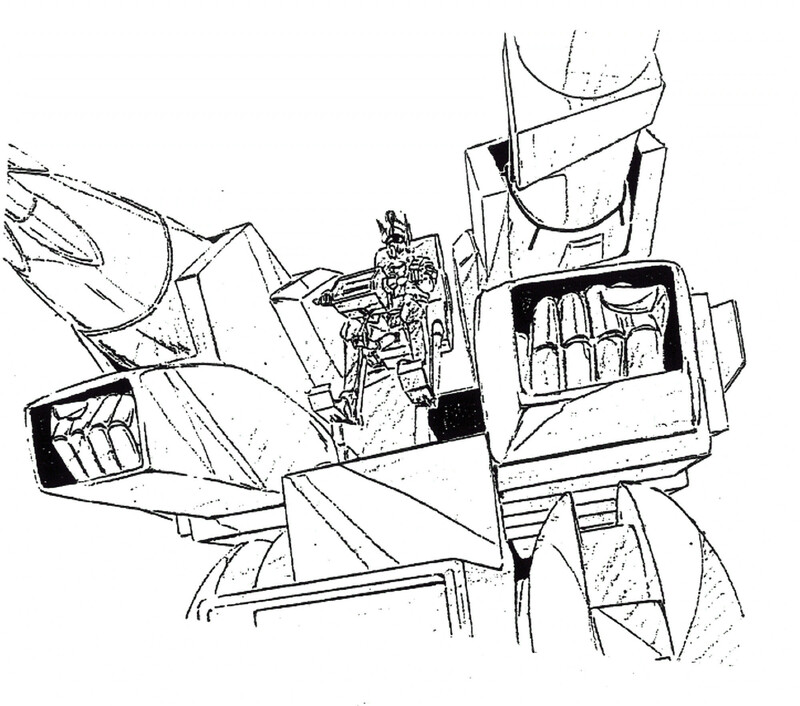 This forced even the front line units to go into combat with the pilot riding in the open atop the mecha in transport and tank modes. 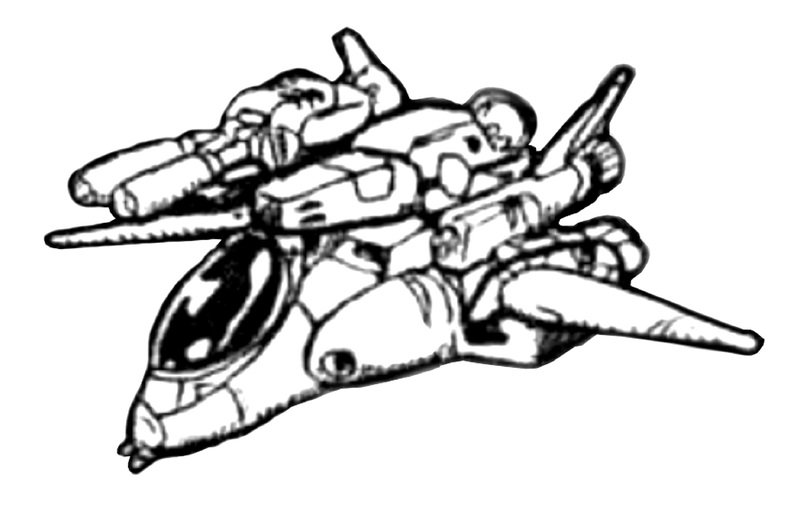 Despite this criminal state of affairs, skilled handling by the unit commanders (and timely conversions to battloid mode) made the VHT-1 Spartas a moderate success in this tasking in the Second Robotech War. 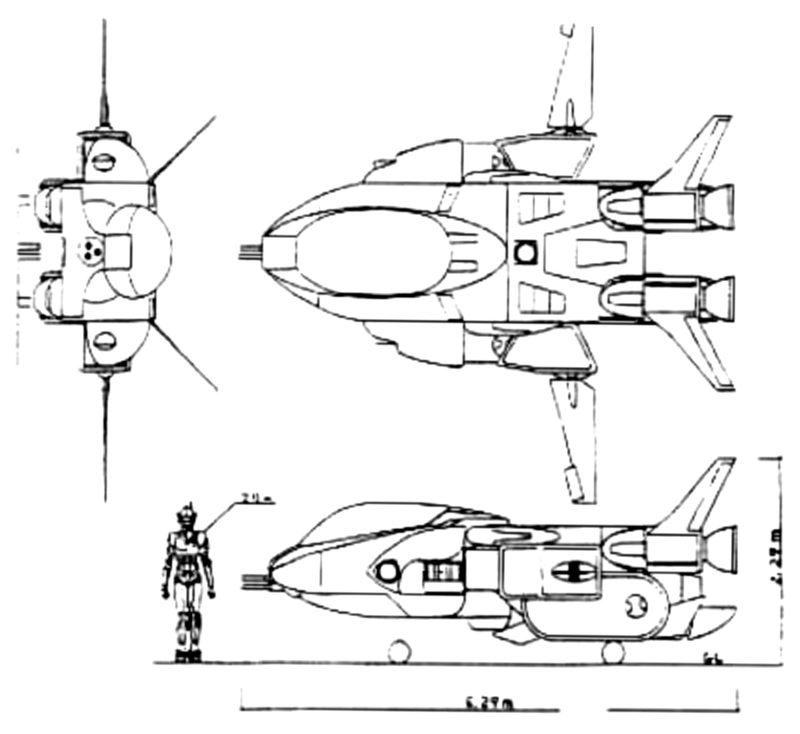 One-on-one, the VHT-1 was superior to the earlier series of Bioroids employed by the Robotech Masters, and at least equal to the later Bioroid designs, including the vaunted ‘Invid Fighter Triumvirates’. 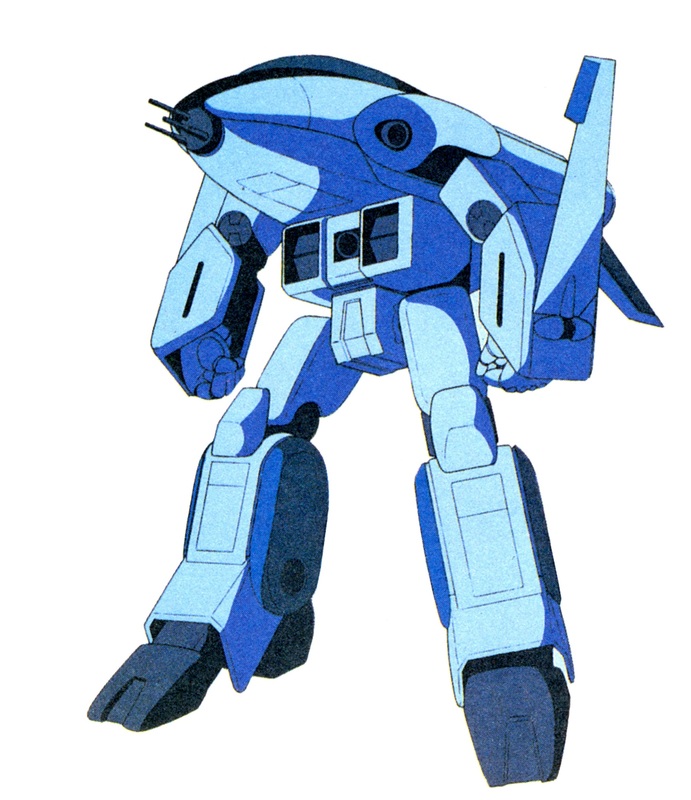 The Second Robotech War saw the Southern Cross’ Spartas fighting everywhere on Earth, as well as in space. The main armament of the VHT-1 was an extremely reliable 105mm smoothbore, which was capable of destroying any known enemy mecha with one round. The only drawback to the design was the limited payload. This was not considered a serious liability given its designed mission. The EU-11 laser rifle likewise proved itself to be a very rugged gun with a heavy punch. The ion cannon was somewhat out of place on this mecha. As an energy weapon it was merely average in yield and effectiveness. To its credit, it did have an unlimited amount of ammunition available. However, as the VHT-1’s mission started expanding, new weapon fits were considered. 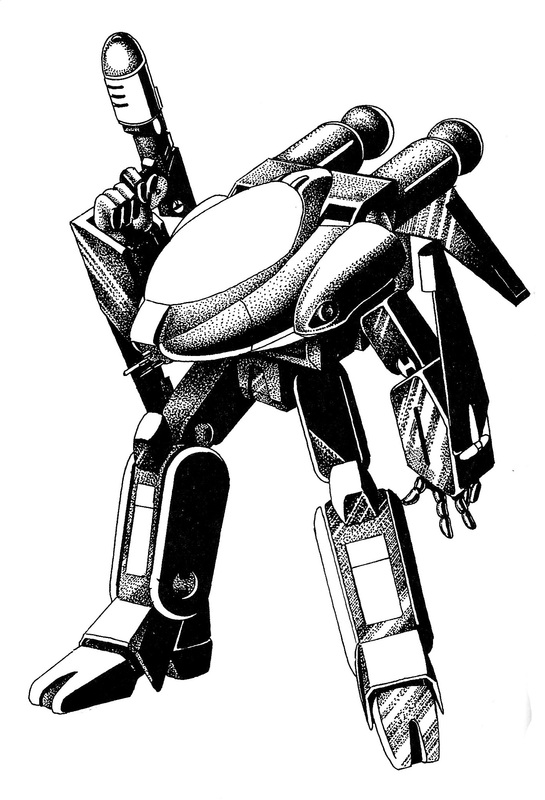 Just before the Second Robotech War, the Southern Cross chose to refit some VHT-1’s with new weapons and armor. Dubbed the VHT-1A1, the upgraded tanks had the smoothbore cannon removed and in its place was installed a particle beam cannon. This eliminated all ammunition constraints on the main gun. 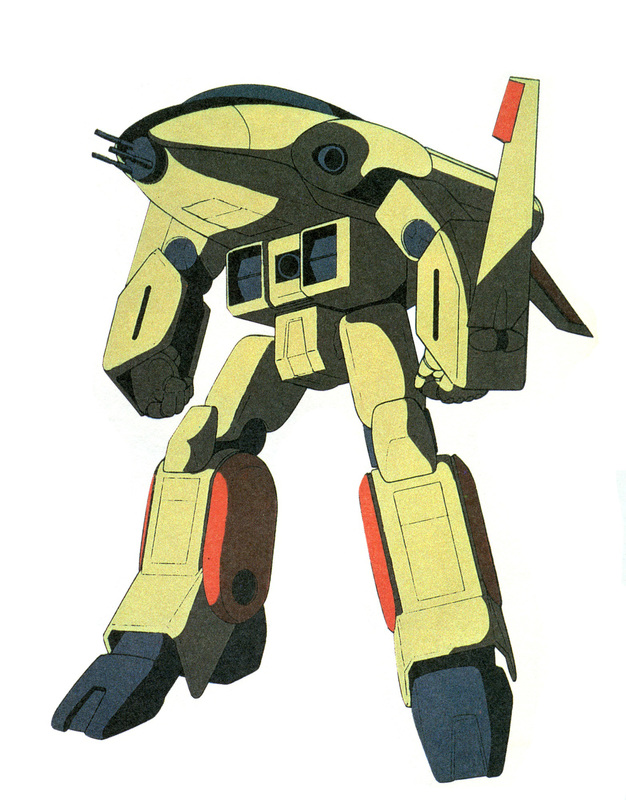 Although many Hovertanks never had the chance to be upgraded before the Invid’s arrival, the VHT-1A1 saw service in a limited capacity as early as the first year of the Second Robotech War and proved popular with its crews, although a complaint was often heard that the troops would have preferred to get their armored pilot compartments debugged instead. During the war itself, an upgrade to the Spartas was called for, and the VHT-1A2 and VHT-1A3 were designed in response. The result was a competition between the these and the Vickers-Chrysler Robotech Systems Inc. VHT-3 Conqueror, the latter a redesigned upsized follow-up of the VHT’s old Centaur II competitor. The VHT-1A2 was a derivative of the 105mm armed VHT-1, with upgraded fire control, an uparmored crew compartment and explosive-reactive armor in key locations. Likewise, the VHT-1A3 was based on the particle beam cannon armed VHT-1A1. The VHT-3 had improved armament as well, in addition to drastic redesigns of its chassis. All suitable factories were naturally tooled for the VHT-1, and would need only minimal retooling for the VHT-1A2/A3s. Given the war that was going on, this pushed the decision once again in the Spartas’s favor. 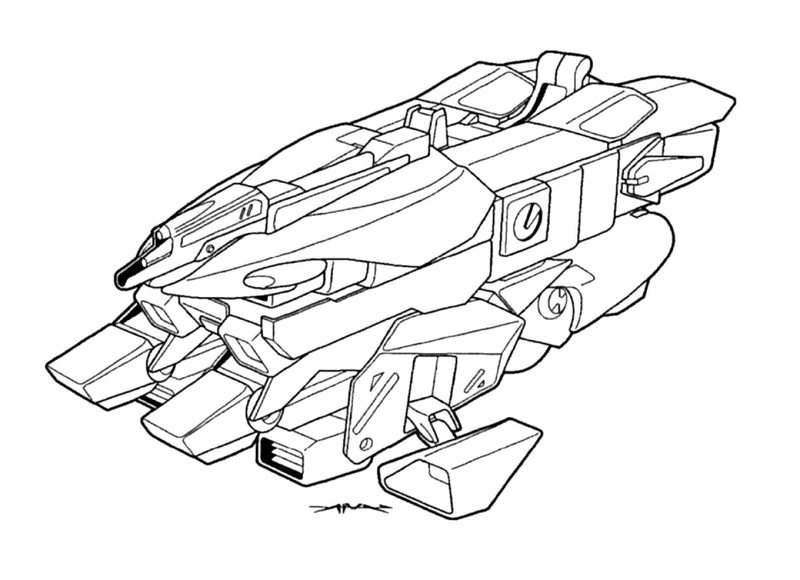 Several dozen new build VHT-1A3 Hovertanks were completed, while a couple hundred VHT-1s were refit to A2 standard. 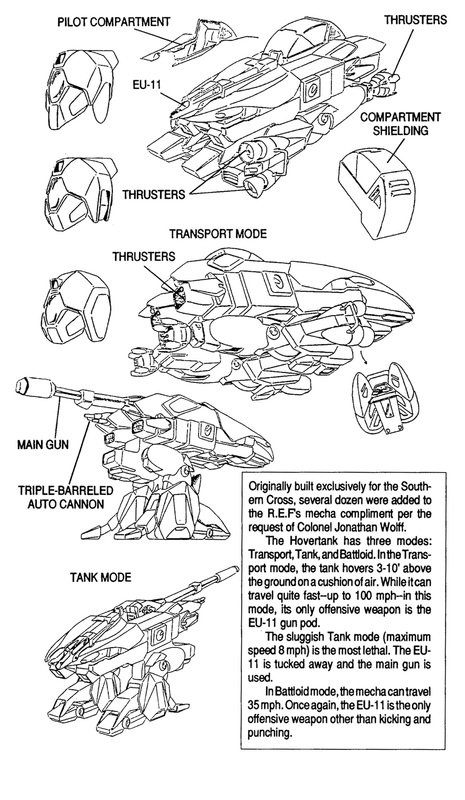 These were issued to select ATAC squadrons just before the war’s end, but this model was never mass-produced due to the serious devastation caused by the war, and series production was planned to start on what turned out to be three months after the Invid Invasion. Northrop Grumman VF/A-8C Logan SVFA-213 “Black Lions” aircraft 108, Donald Hayes Aerospace Base, Monument City, Ontario, Canada (2029), fighter mode 3/4 view. In the late twenties, the Tactical Armored Space Corps (TASC) found itself increasingly tasked with terrestrial air supremacy. Because of this, from 2027, all TASC Logans were painted in over-all haze blue. The example above featured dark blue trim on the legs and slats, consistent with the squadron colors of SVFA-213. Northrop Grumman VF/A-8C Logan SVFA-213 “Black Lions” aircraft 108, Donald Hayes Aerospace Base, Monument City, Ontario, Canada (2029), Battloid mode view. Northrop Grumman VF/A-8C Logan SVFA-213 “Black Lions” aircraft 101, Donald Hayes Aerospace Base, Monument City, Ontario, Canada (2029), fighter mode 3/4 view. Typical of most squadron commanders, SVFA-213 Commanding Officer’s Logan had a unique paint scheme. In this case, the fighter was painted over-all desert sand with high viability “blaze orange” trim. Northrop Grumman VF/A-8C Logan SVFA-213 “Black Lions” aircraft 101, Donald Hayes Aerospace Base, Monument City, Ontario, Canada (2029), Battloid mode view. 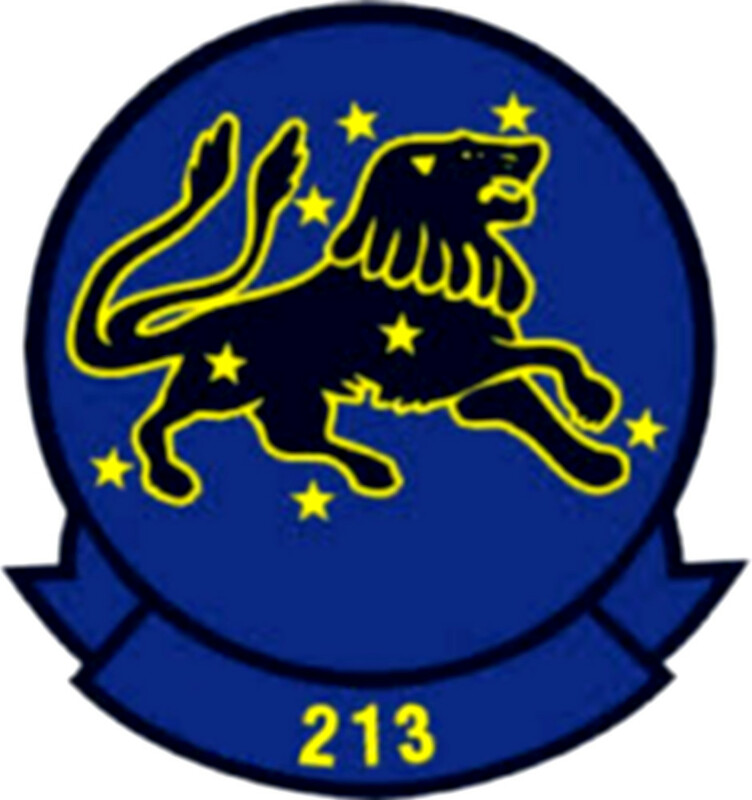 SVFA-213 “Black Lions” squadron patch. Liège Industries Lourd’s corporate logo. Acknowledgement is extended to Yui Yuasa and her excellent Japanese language Robotech fan page. Yui Yuasa is given credit for all quotes and paraphrasing of her site that has been utilized in this publication. 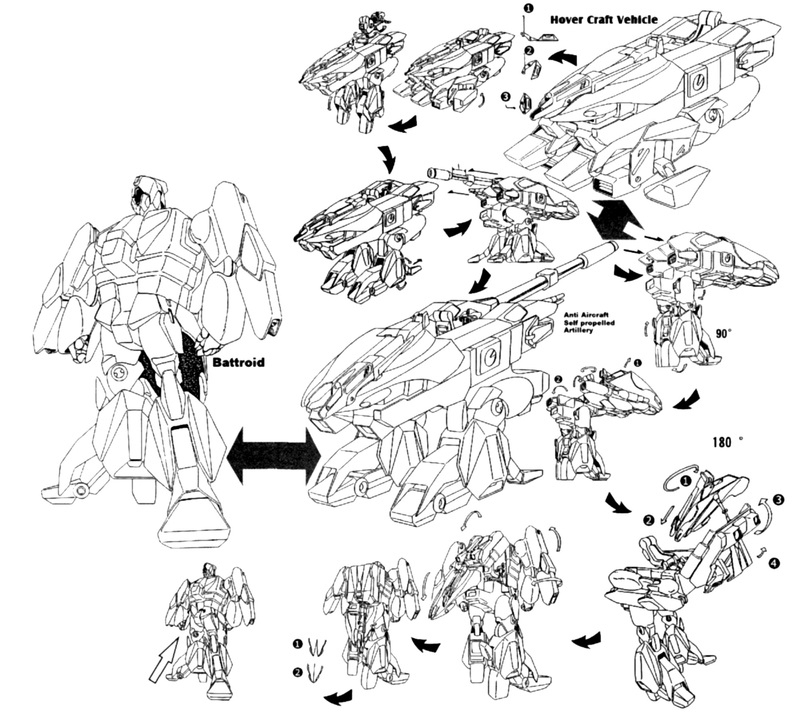 Images from – Unspecified Super Dimensional Cavalry Southern Cross OSM, Robotech RPG (1st Edition) Southern Cross Sourcebook and Robotech RPG (2nd Edition) Southern Cross Sourcebook. Lockheed VFH-10B Auroran AGACS SVFA-213 “Black Lions” aircraft 103, SCB-01 UES Tristar (2030), Battloid front view. 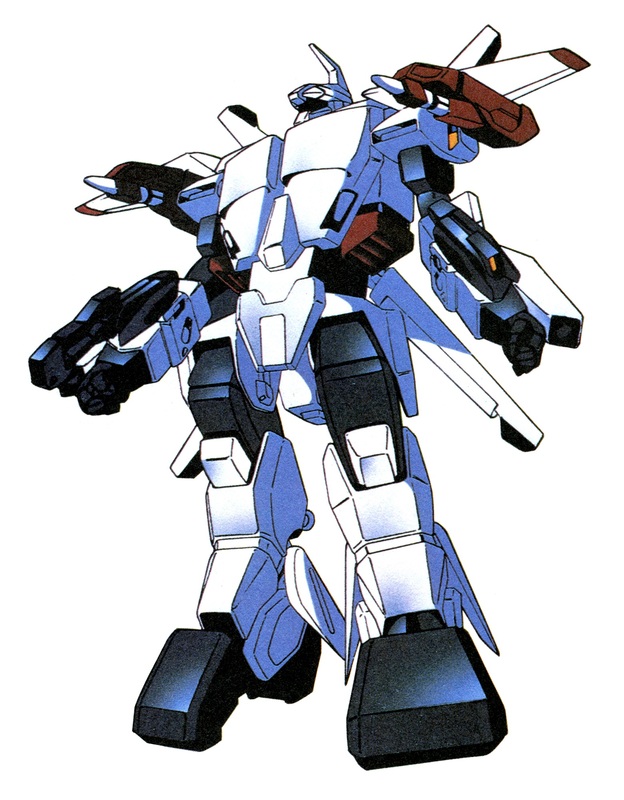 In the later part of the Second Robotech War, the standard paint scheme for the United Earth Defense Force (UEDF) Tactical Armored Space Corps (TASC) was high-gloss white, trimmed in colors particular to the aircraft’s squadron. The light colored gloss paint was used as its ability reflect some laser energy was considered more important than the need to be less observable. Lockheed VFH-10B Auroran AGACS SVFA-213 “Black Lions” aircraft 103, SCB-01 UES Tristar (2030), Battloid rear view. Lockheed VFH-10B Auroran AGACS SVFA-213 “Black Lions” aircraft 103, SCB-01 UES Tristar (2030), helicopter mode front 3/4 view. Lockheed VFH-10B Auroran AGACS SVFA-213 “Black Lions” aircraft 103, SCB-01 UES Tristar (2030), fighter “Crusader” mode ventral 3/4 view. 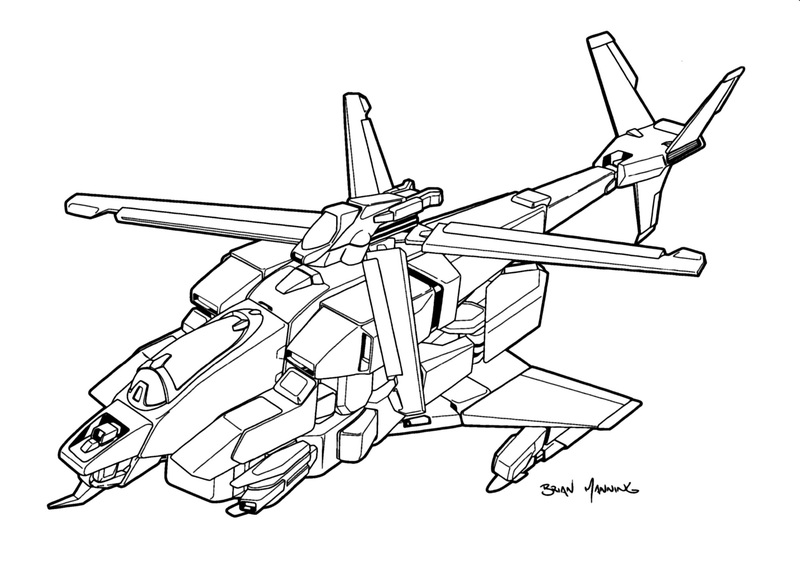 XV/H-1: Technology demonstrator, experimental aerospace combat mecha; three-form Veritech. 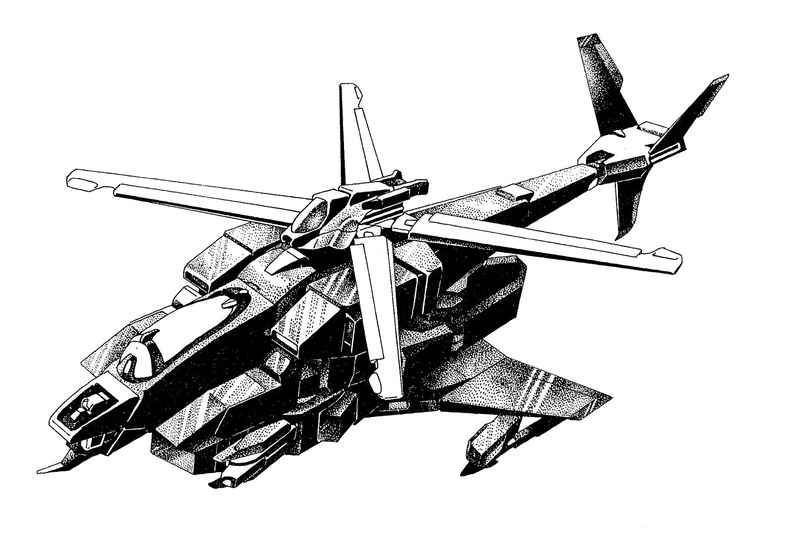 YVFH-10: Prototype single seat, all-weather, aerospace combat mecha; three-form Veritech. 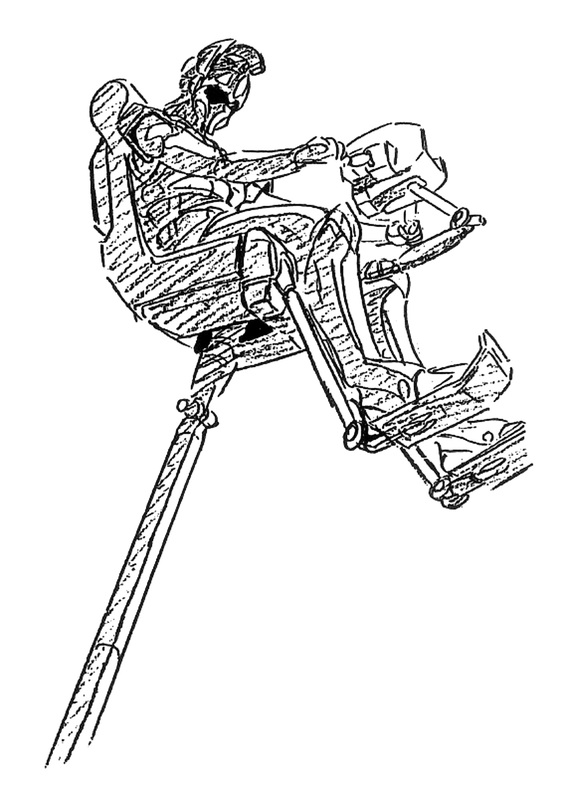 VHF-12: Single seat, all-weather, aerospace combat mecha; three-form Veritech. XV/H-1: Lockheed independently funded technology demonstrator. First flight in 2023. YVFH-10A: Pre-production test and evaluation aircraft, served with the Tactical Corps in 2028 to 2030 in small numbers. YVFH-10B: Pre-production test and evaluation aircraft, served with the Tactical Armored Space Corps in 2029 and 2030 in small numbers. 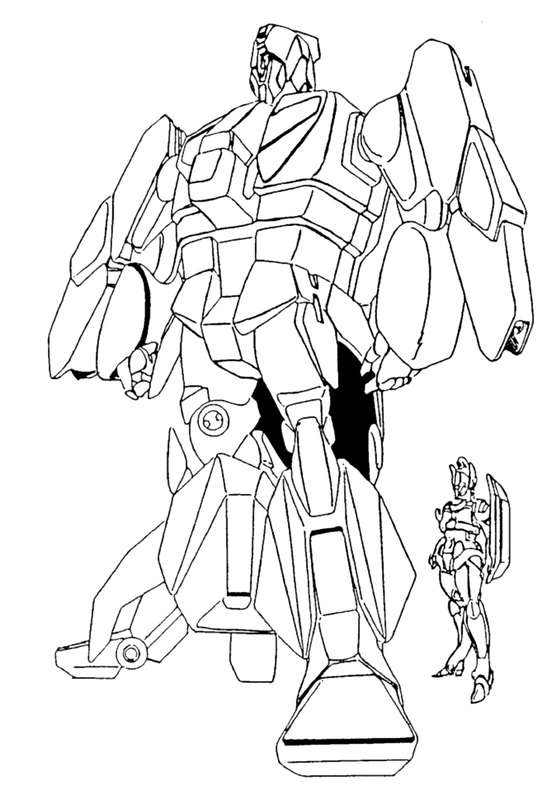 VFH-10A: Intended to serve with the Tactical Corps from 2030, however, following the outbreak of the Second Robotech War, all A models were assigned to the Tactical Armored Space Corps. After the end of the war, these A variants (along with new build examples) were repatriated to the Tactical Corps, where they served in their originally intended role until the Invid invasion. All VFH-10As were built by subcontractor Liège Industries Lourd. 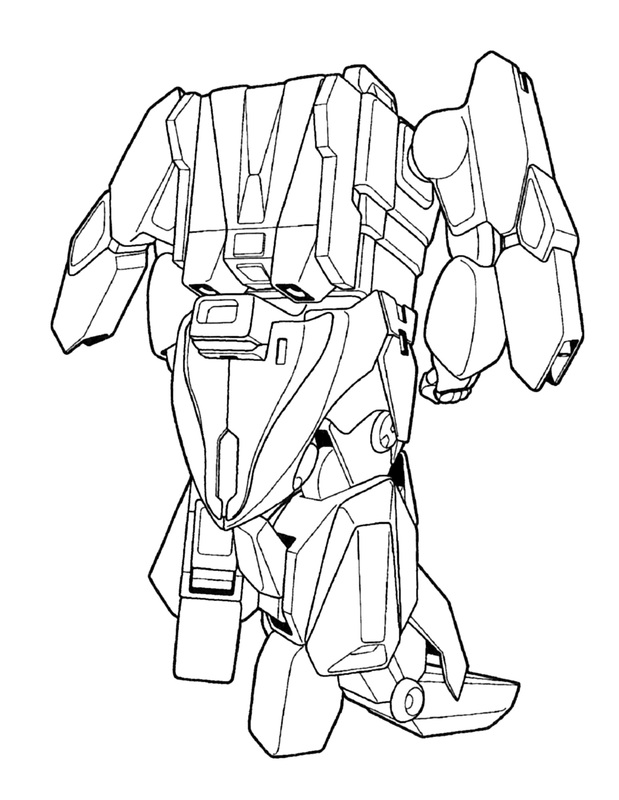 VFH-10B: Served with the Tactical Armored Space Corps from 2030 until the Invid invasion. All VFH-10Bs were built by Lockheed. Engines (main): 2 x Pratt & Whitney JG95B MPL fusion intermix engines, Max. output, 118 kN each. The engines are mounted along the sides in Battloid mode, with the nozzles pointing toward the feet. In Helicopter mode, they point aftwards, and are located just below the rotor assembly. In Fighter mode, they are located above and before the upper wings (former rotors) and on the upper edge of the fuselage over the wings. These engines also provide 4700 kW to the counter rotating rotors through a heavy duty gear box. Engines (aux): 3 x Nakajima NBS-2 high-thrust plasma-shock expansion boosters in the tail, with a fixed output of 50 kN each. 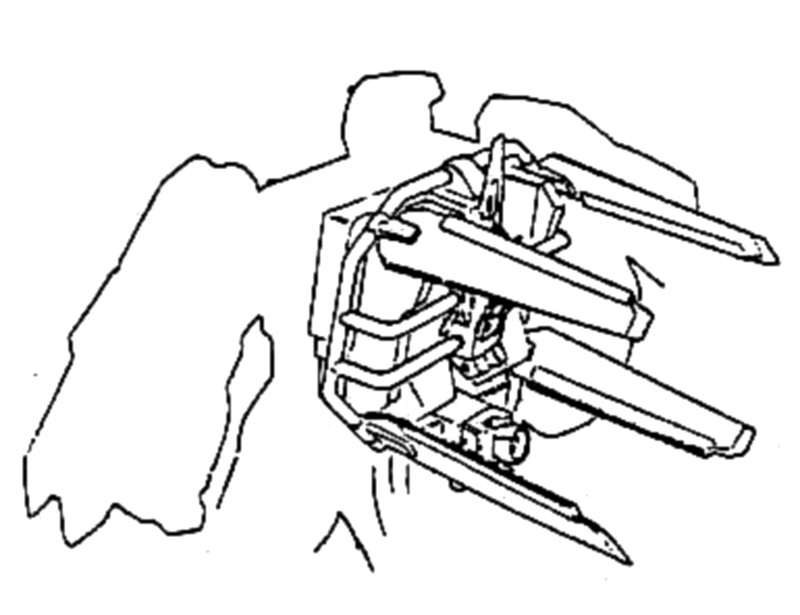 Maneuvering thrusters (main): 4 x Turbo-Union ABB-3 boosters in the back of the calves in Battloid mode, and in the inside of the lower fuselage, thrusting aft from between the funnel formed by the legs in Fighter and Helicopter mode. 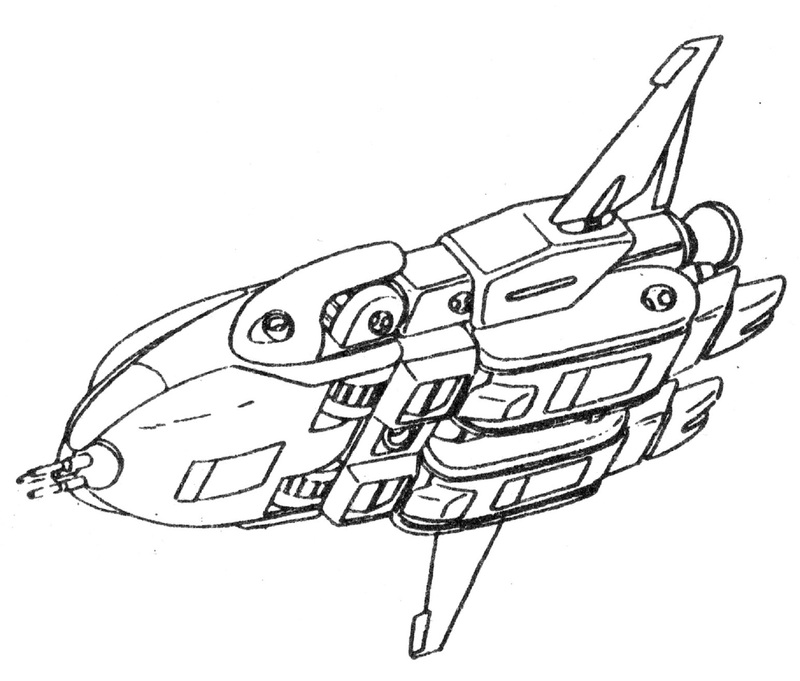 Maneuvering system (aux): small gyroscopes internally, and numerous exhausts spread over the surface of the mecha and the rotor blades. The most pronounced at the pair on each arm, the ones at the end of each rotor and the pair on the chest. 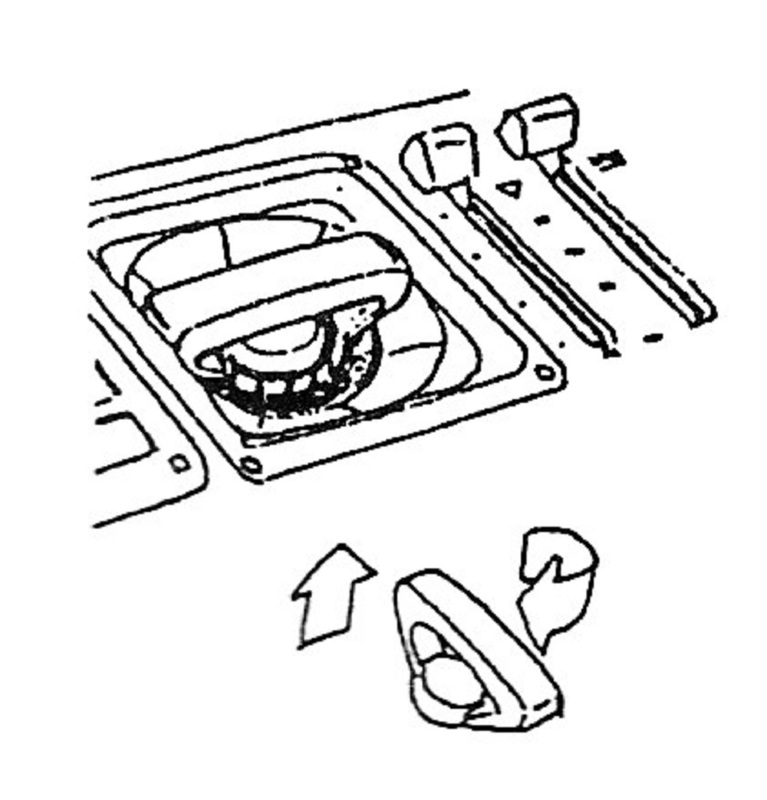 The auxiliary thrusters bleed off exhaust from the large maneuvering boosters and main engines. Powerplant: 1 x Monument Propulsion RRL-2R Miniaturized Protoculture-cell energizer. 10.8 lit. D2O for the fusion engines. Assorted small reaction thrusters and gyroscopes for all-environment maneuvers, attitude adjustment, and stability. Combat radius (space): Total delta-v 4.6 kps, with internal reaction mass only. An extra tank for 2.5 kps delta-v can be attached under the centerline of the craft. This tank however must be ejected prior to transformation to Battloid mode. Westinghouse APG-145 X-band spherical pulse-doppler long-range radar. Thomson LT-5 multi-frequency laser ranger and designator. Zeiss high-sensitive long range IIR/LLLTV/UV telescope system in the nose. This system has a high angular resolution and is optimized to detect possible targets in vacuum conditions. Phillips AllView II multi-band omni-directional digital camera system, for medium range all attitude infra-red imaging, optical and ultra-violet band detection and tracking. 2 x Bofors IWS-40 40mm ion pulse weapon. The IWS-40 is a pulse ion system capable of a 10 MJ laser pulse up to 80 times per minute. It is available in all flight modes. or 2 x Mauser EU-22 double barreled pulse laser. The larger EU-22 gunpod fires either a lower-power laser pulse of 6 MJ up to 160 times per minute, or a 12 MJ pulse up to 80 times per minute. 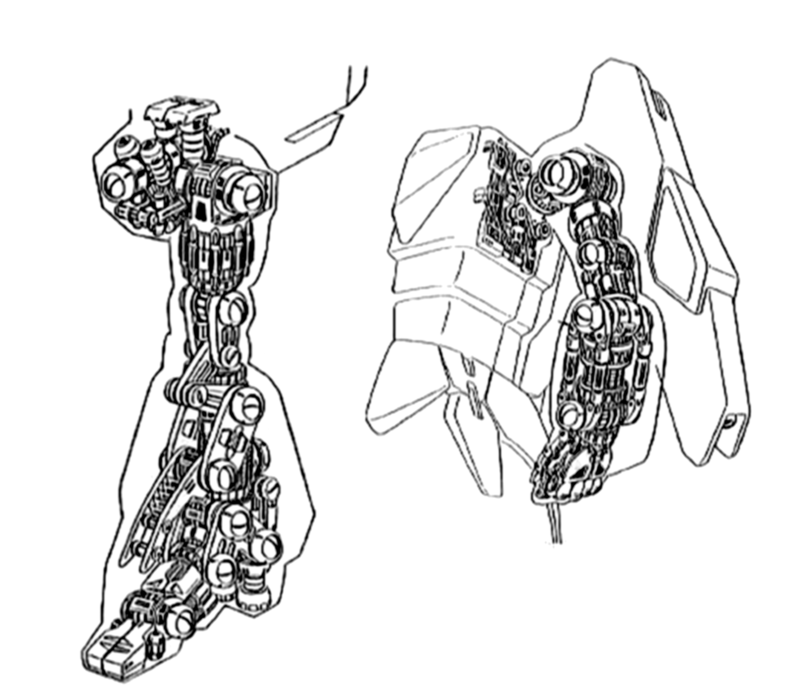 Normally, both arms have a gunpod mounted of the same type, but it is possible to mount different pods on both arms. 1 x General Electric EU-23 laser cannon in the nose in front of the cockpit, delivering 9 MJ of laser energy every second. Available in helicopter and fighter modes. 2 x TLM-1A semi-fixed Missile launchers, firing medium-range multiple warhead 260mm x 1.2m Lightning or Ragnarok (Californium tactical nuclear) missiles. Each launch tube contains three missiles, with three additional missiles stowed in the bin above it for a total of 6 MRMs. Guidance is standard active radar/home-on-jam and thermo-imager, range up to 40 kilometers. 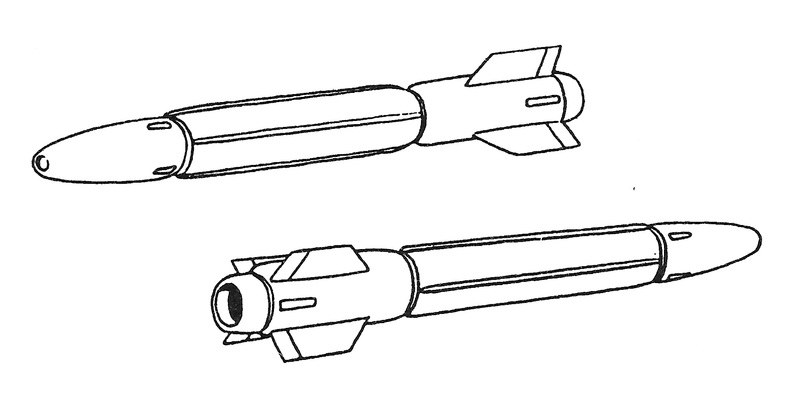 The external dimensions of the missiles are identical to those of the standard medium-range Diamondback missile, and these missiles are compatible with the TLM-1A launcher. However, though their range is larger, the lethality of these missiles is far inferior. This launcher is mainly used by space-borne VFH-10A AGACS with the TASC. or 2 x TLM-1B semi-fixed Missile launchers, firing short-range (8 km) Mach 3.0 combined infra-red imager and active radar homing 190mm Hammerhead missiles. Each launch tube contains five missiles, with ten additional missiles stowed in the bin above it, for a total of 15 SRMs. This launcher is mainly used by AirCav VHF-12B AGACS with the TC. 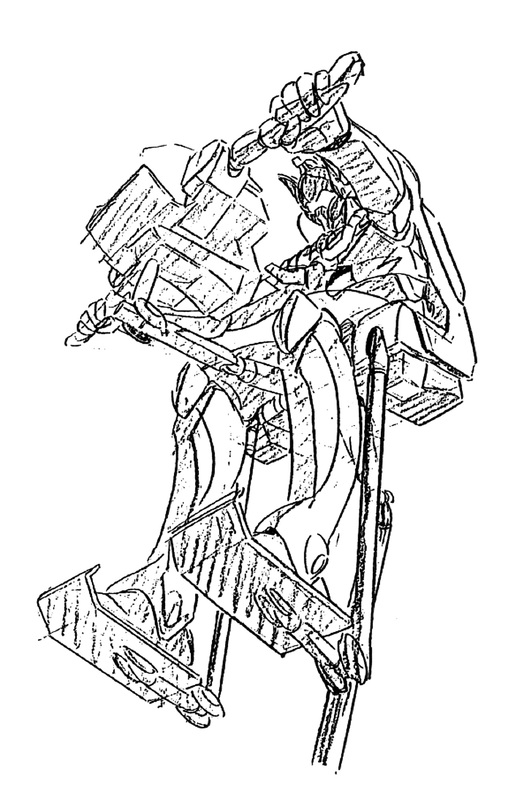 The armor on the AGACS is a new development in low-mass composite-materials Chobham plating that became the standard for all Terran mecha after its application to the VQ-6A Vandal. 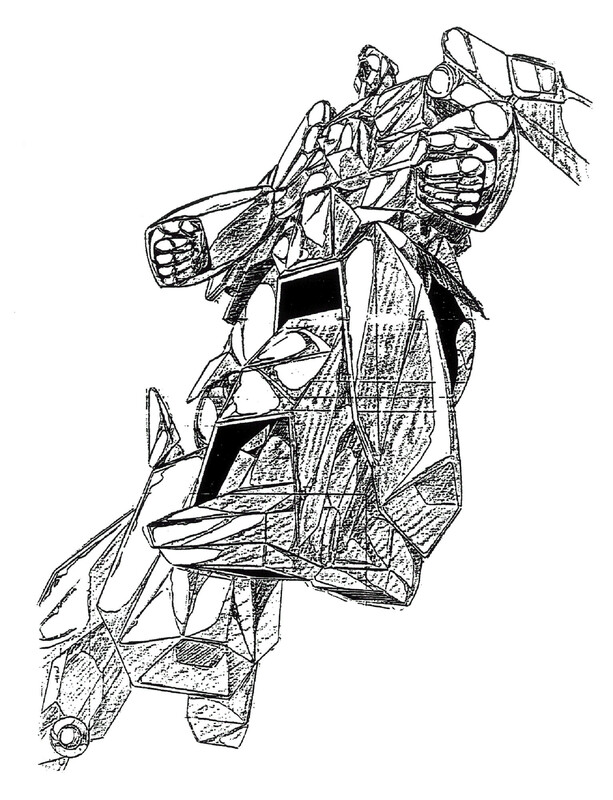 Aside from the respectable protection provided against projectiles, missiles, and other kinetic weapons, this armor is also resistant to plasma globes (annihilation discs), lasers, and to a lesser extent, particle guns, owing to the fact that the armor can flake off and evaporate in layers under fire from such high-energy weapons, taking much of the weapon’s energy and converting it into the latent heat of sublimation in the armor. 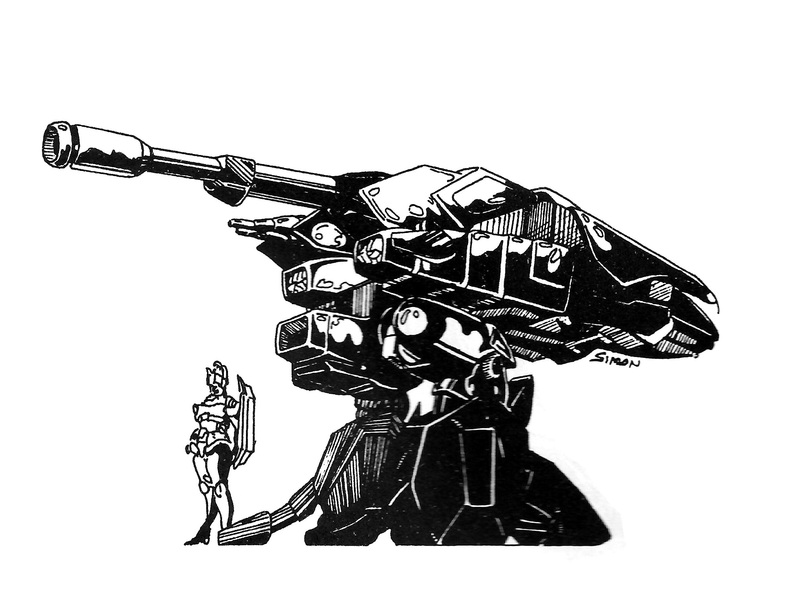 The armor stops all small arms and heavy infantry weapons fire, provides good resistance to light mecha-mounted weaponry, such as the Zentraedi 22.3mm HE autocannon round, and poor resistance to medium mecha-mounted weaponry, such as the Valkyrie’s 55mm APFSDS round. The AGACS provides full protection from nuclear, biological, and chemical hazards, using an overpressure cockpit environment activated by radiation and hazardous chemical sensors, or manually when biological warfare conditions are anticipated. The internal consumables supplies can provide atmosphere for one day maximum. 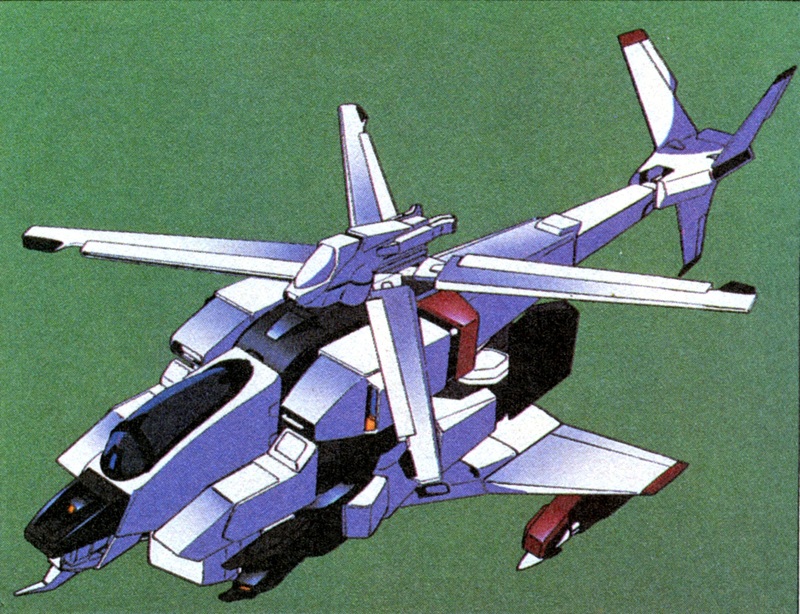 The Lockheed VFH-10 Auroran, much more commonly known by the acronym Aerospace Ground Attack/Combat Support (AGACS), or colloquially the Ajax, was developed to serve as a variable attack helicopter for the United Earth Defense Force (UEDF) Tactical Corps (TC). Later, it was successfully adapted by Lockheed to serve as a variable space fighter for the UEDF Tactical Armored Space Corps (TASC). Because there was a pressing need to replace the aging fleet of Sikorsky AH-68 Comanchero attack helicopters, Lockheed’s undoubtedly bizarre XV/H-1 Veritech Helicopter demonstrator of the early twenties was developed into the VFH-10 Auroran AGACS. Because it was meant to serve as a close air support aircraft, the AGACS was not required to reach high Mach numbers, and more time could be devoted to improving the slow-speed near-ground flight characteristics. The modest Mach 1.6 it could reach sufficed to engage its intended enemies. The missile armaments were specially designed for this task; the AGACS could be equipped with the most lethal medium-range missiles developed to date, the Lightning missiles, in addition to the more conventional Hammerhead and Diamondback. 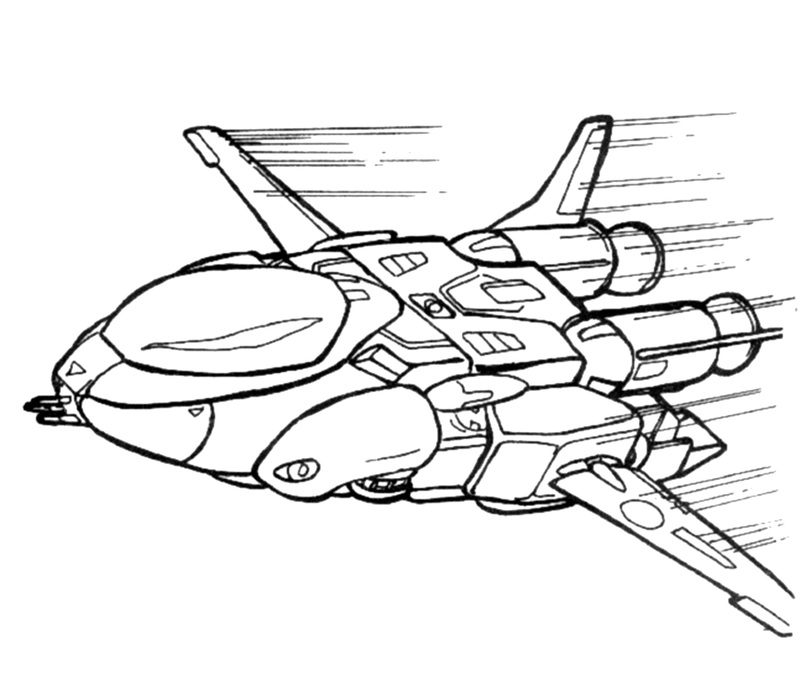 The Lightning released cluster warheads near their target, and is capable of taking out several battlepods or power armors per missile. The UEDF hoped that this would offset the numerical advantage the Zentraedi (and the Soviets) were thought to have. 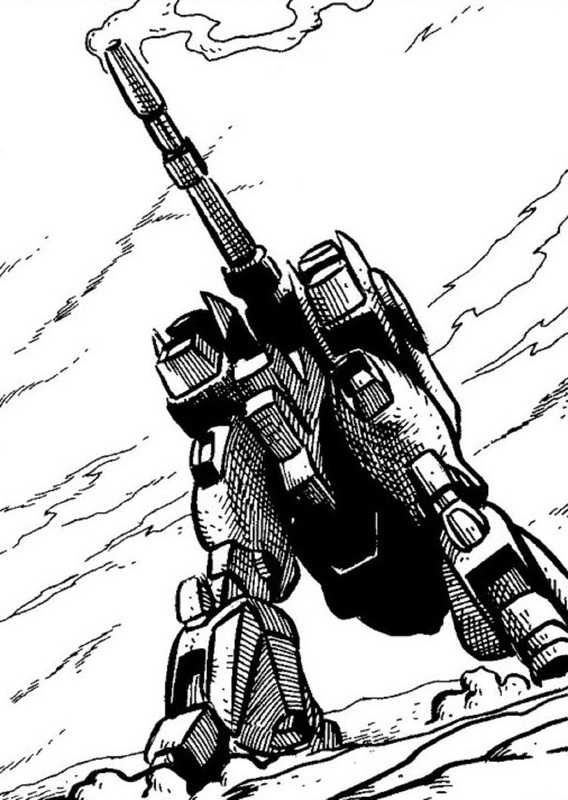 After the missiles had been fired, the AGACS were supposed to use their impressive mobility and their powerful laser to destroy the remaining mecha. Ironically, the Tactical Corps usually fitted other missiles to the mecha, when it found out that the Tirolians were often engaged inside Earth’s cities and installations. 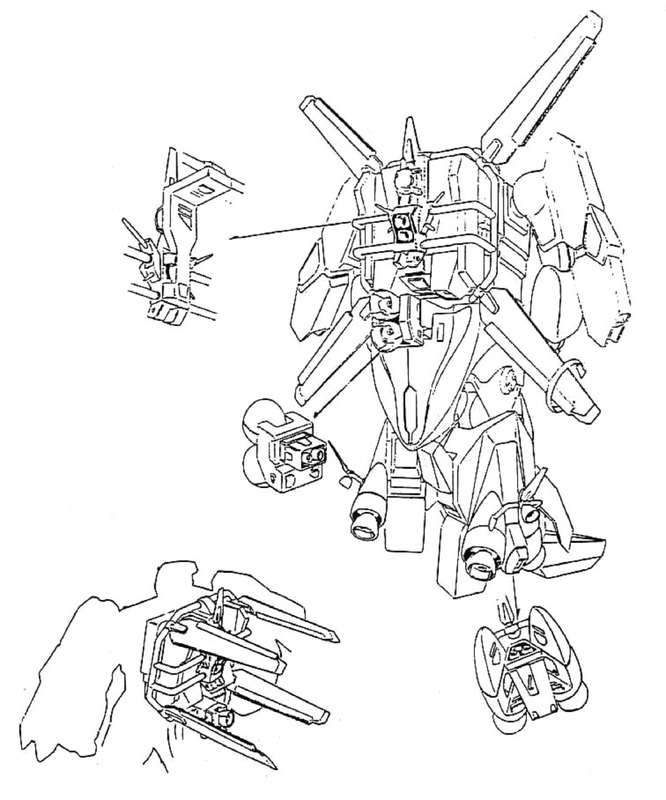 Later, Invid mecha were more often engaged at close range with smaller missiles than at long range with cluster warheads, for the maneuverable Invid were more adept at scattering (and cluster-defeating) tactics than the Zentraedi or the Tirolians. Lockheed adapted the AGACS with minimal modifications to operate in space. In space, the AGACS offered a small, maneuverable target which was difficult to hit. In this theatre the advanced missiles would also be very effective, and the laser, unhindered by any atmospheric conditions, would offer long range in addition to a high rate of fire, the latter to both increase delivered damage and to increase the chances of a hit. Unlike its Logan contemporary, the AGACS’ intermediate form was that of a helicopter. The helicopter capabilities were equal to those of the GERWALK mode, however it was able to loiter indefinitely. This was due to the fact that a Veritech operating at low speeds in GERWALK mode had a somewhat limited loiter time before heat build-up would cause engine failure. This situation was alleviated by a pair of counter rotating helicopter blades. 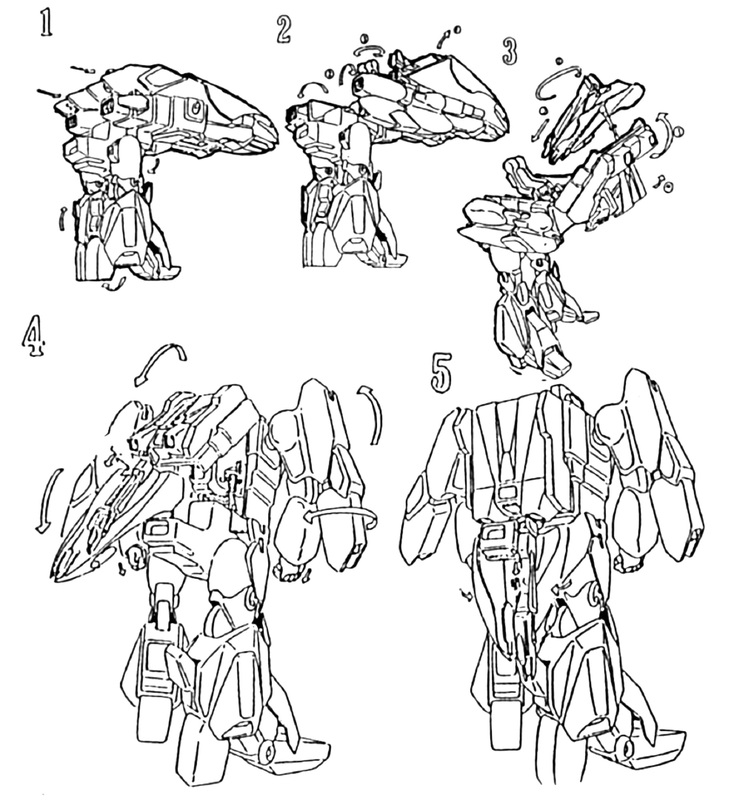 Additionally, the transformation sequence required only minimal modifications from the Fighter mode increased the internal space. The extra room was used to increase the number of quad-protoculture cell energizers installed to three, and the extra power allowed a substantial increase in the delta-v by boosting the engines’ magnetic bottling so as to increase engine temperature and reaction-mass-to-thrust efficiency. The additional power was also employed by the laser, which eliminated any ammunition problems and vastly increased the rate of fire. This was significant, because neither launcher package carried near as many missiles as other weapons platforms. Due to certain minor differences in the required sensor and electronics fittings of the AGACS between the TASC and the TC, two different versions were procured: the TC’s VFH-10A and the TASC’s VFH-10B. Additionally, the TC’s VFH-10A did not mount Vernier thrusters, though the mounting points were present and this variant could easily be fitted with them. 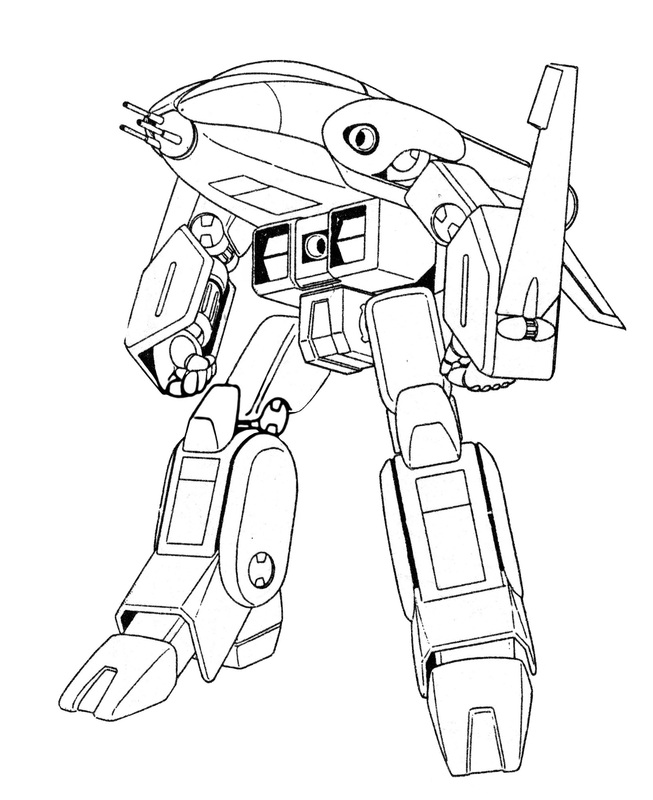 Indeed, almost all VFH-10A TC AGACS were pressed into TASC service in the latter stages of the Second Robotech War. The differences were mainly the deletion in the VFH-10A of the nose-mounted high-definition, narrow-angle IIR sensor, which was of dubious advantage on Earth given the relatively closer ranges at which it would be fighting. Instead, the VFH-10A mounted another laser cannon in that space. Further minor differences concerned the Veritech’s climate control system, which was more geared towards atmospheric operation in the VFH-10A, though still quite capable in a vacuum, and in other environment-specific systems such as a more robust brake system for the more common unarrested landings. The UEDF was very impressed with the first series of pre-production YFH-10 procured for operational testing. While the designated TASC squadrons were evaluating the space performance of the AGACS in 2029, the Tirolian invasion fleet arrived near Luna. A battle immediately ensued, and the AGACS performed quite well in its baptism of combat. Immediately after this first clash with Bioroids, the AGACS was ordered into full war production. Unfortunately, setting up the production lines took more effort than expected, and it was not until over a year later that the AGACS was introduced to the Armies of the Southern Cross in large numbers, with first priority being assigned to the VFH-10B for the hard-pressed TASC. 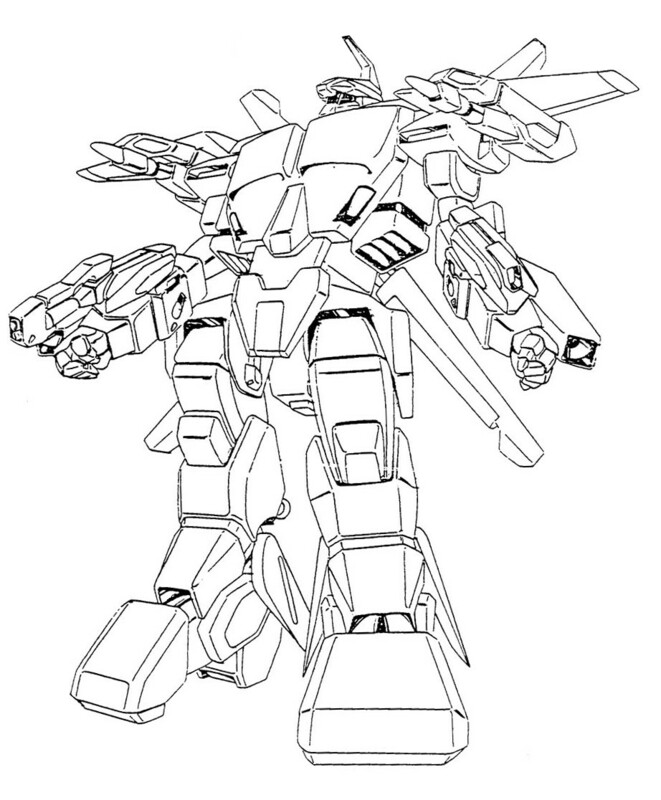 Thousands of AGACS were produced during and after the Second Robotech War and deployed against the Tirolian and Invid forces. 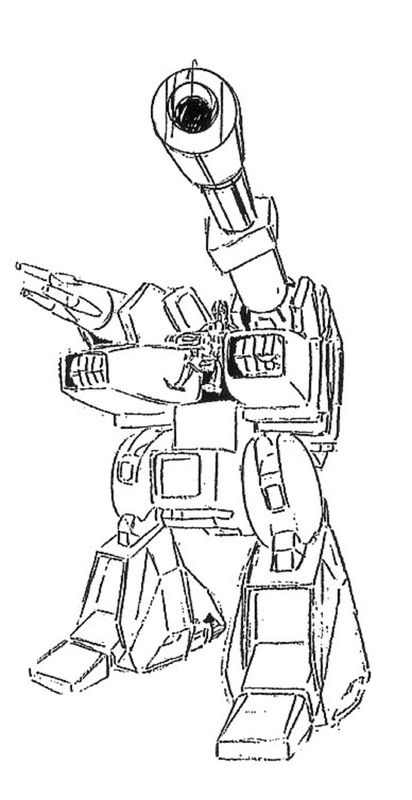 This mecha was initially mostly used in space, where the maneuvering thrusters in the helicopter blades gave the AGACS somewhat more agility than the VF-8 Logans it was replacing. 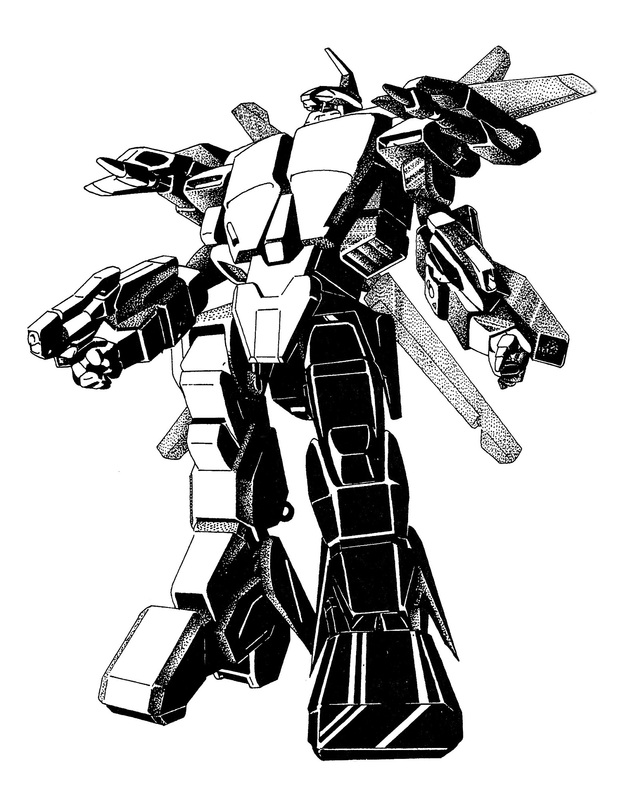 The heavy missiles especially came in very handy against the Masters’ mecha, which were far more heavily armored than those of the Zentraedi, the envisioned opponents against which the AGACS never saw action. 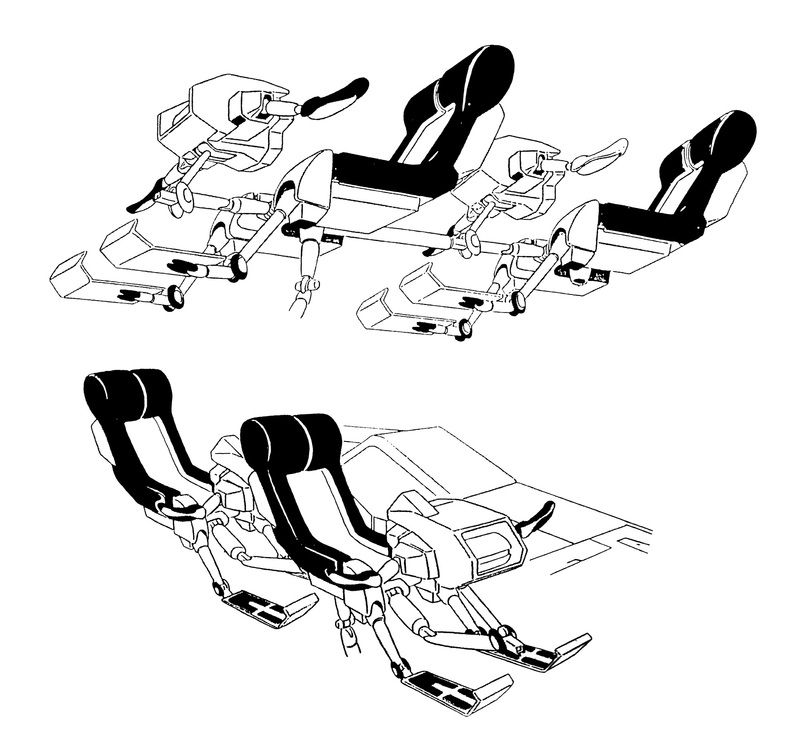 Single seat, all-weather, aerospace combat mecha; two form Veritech. VFA-8A: Served with the UEDF’s Tactical Armored Space Corps from 2018 until replaced by the VFA-8C. VFA-8B: Served with the REF from 2018 until transferred to the UEDF. Served with UEDF’s Tactical Armored Space Corps from 2025 until replaced by the VFA-8C. VFA-8C: Served with the UEDF’s Tactical Armored Space Corps from 2026 to 2031. VF-8N Sea Logan: Served with the UEDF’s Navy Corps from 2023 until replaced by the VF-8NB. VF-8NB Sea Logan: Served with the UEDF’s Navy Corps from 2026 to 2031. VT-8A: Served with the UEDF from 2018 to 2031, and with the REF from 2018 until transferred to the UEDF in 2025. Main Engines: 2 x Monument Propulsion Labs MPL-3001 fusion intermix turbines in the upper aft fuselage, total thrust 131 kN. Intakes are located on the upper fuselage, to either side of the rear of the canopy. Auxiliary Engines: 2 x General Electric FPB-20 Boosters in the legs. These engines use reaction-mass only, and are rarely used in an atmosphere. 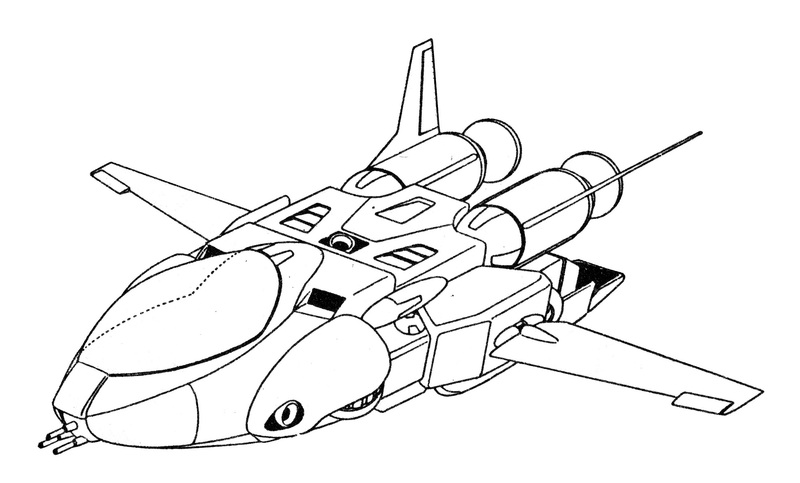 Each engine has two exhaust ports: one in each heel, and one at the junction of the leg in the fuselage, pointing downward in fighter mode and forward in Battloid. Max. thrust is 36 kN per engine. 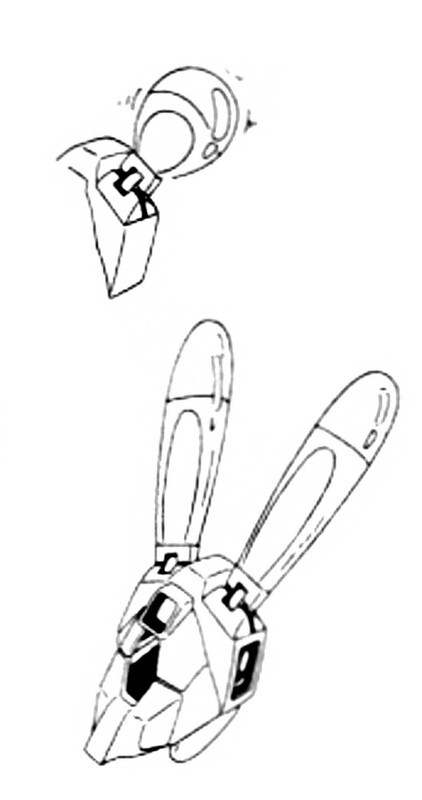 Vernier Thrusters: 4 x Nakajima NBS-2 high-thrust chemical reaction thrusters, located in the center of the upper and lower fuselage, and in the Battloid’s shoulders. 3.4 lit. D2O (deuterium oxide) reactant for fusion engines. Maximum roll rate (650 kph at 3000 meters): 300 degrees / sec. Maximum roll rate (1000 kph at 3000 meters): 300 degrees / sec. Maximum turn rate (180 degree turn, 1000 kph at sea level): Up to 10.0 G, 26.5 degrees/sec. Maximum turn rate (360-degree turn, 750 kph at sea level): 9.5 G, 24 degrees/sec. Maximum turn rate (180 degree turn, 750 kph at sea level): Up to 9.0 G, 25.7 degrees/sec. Maximum turn rate (360-degree turn, 1000 kph at 10,000 meters): 8.5 G, 21.6 degrees/sec. Maximum turn rate (180 degree turn, 750 kph at 10,000 meters): Up to 8.0 G, 17.5 degrees/sec. Maximum turn rate (360-degree turn, 750 kph at 10,000 meters): 5.5 G, 10.0 degrees/sec. Combat radius (space): Total delta-v 6.1 kps, with internal reaction mass only. An extra tank for 4.1 kps delta-v can be attached externally. Protoculture supply: 168 hours of continuous use. Westinghouse APG-140 X-band pulse-doppler active phased array medium-range radar, with 140 degree field of view and a maximum detection range for a Reguld size target of 240 km. Selenia SkyWarrior active/passive sensor jammers. 1 x Oerlikon LPW-20 triple-barreled 20mm plasma cannon in the nose, one burst delivers an average of 15 MJ of thermal and kinetic energy; there is sufficient energy in the capacitors for 8 seconds of continuous fire, the generator can create sufficient power for 15 bursts every minute. The maximum effective range is 900 meters. 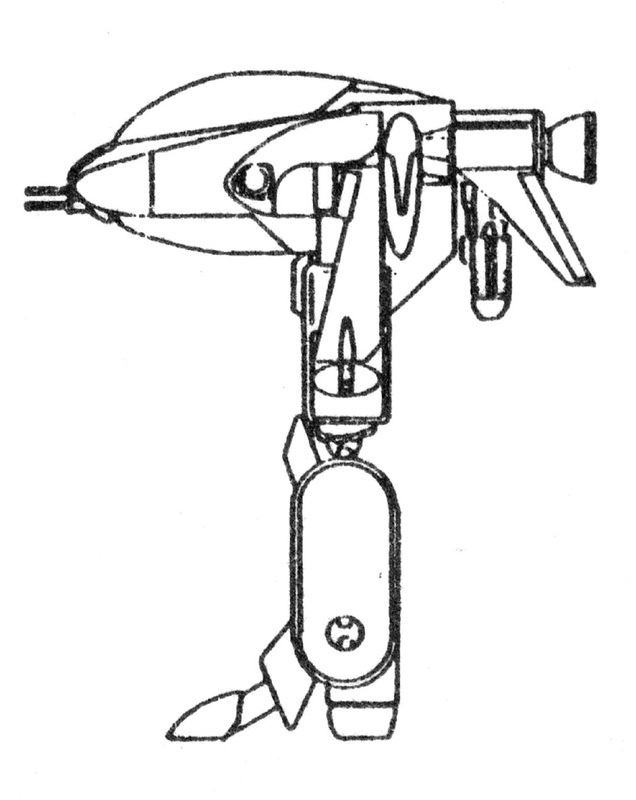 1 x General Electric E-20 20mm Laser Gun Pod mounted on a swiveling mount in Fighter mode and in the hand in Battloid mode, delivering 8 MJ of laser energy up to 60 times per minute. Maximum range is 1200 meters. 1 x Python missile, with a range of 75 km and a speed of Mach 3.0, with active-passive radar/home-on-jam and IIR guidance. or 1 x Carapace missile container, containing three missile tubes, each of which can contain two Diamondback or Lightning missiles, or four Hammerhead missiles. or 1 x 70mm unguided rocket pod. or any other military load, such as ECM pods, cargo pods or recon pods. The skin of the Logan is composed of an advanced titanium-steel alloy, except that on the wings, which is made from a low-mass Chobham armor like that on the AGACS. 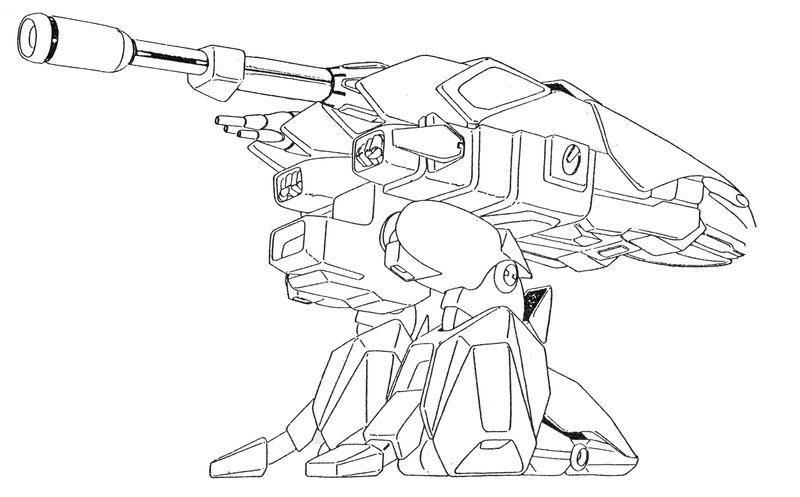 The armor stops all small arms fire, provides good protection against heavier infantry weapons, such as a 12.7mm machinegun round, and fair resistance to light mecha-mounted weaponry, such as the Zentraedi 22.3mm HE autocannon round. The armor on the wings is considerably stronger, allowing them to be used as parrying shields in close quarters while in Battloid mode. 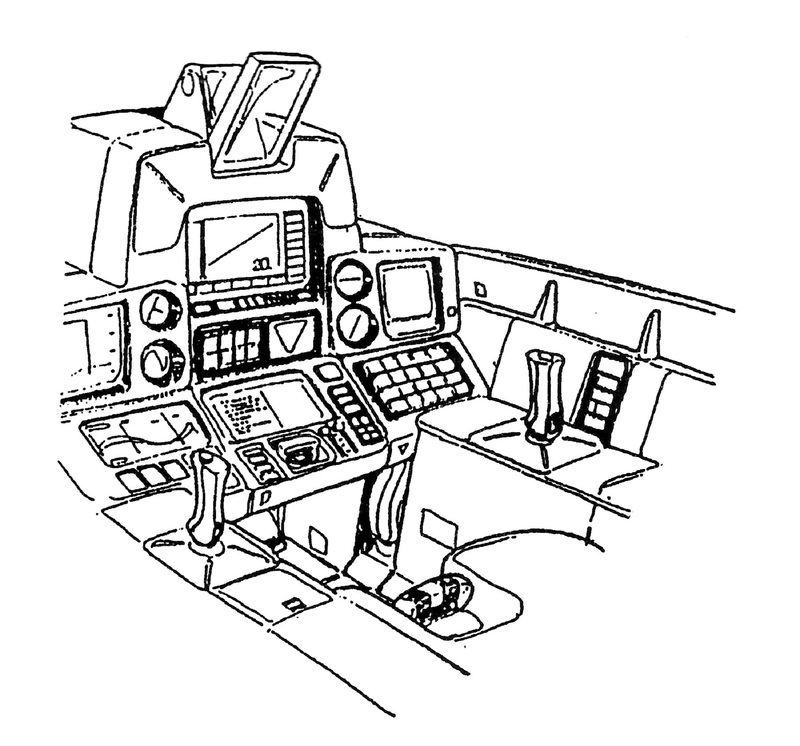 The Logan’s cockpit is a very exposed structure in all flight and ground profiles. This makes the pilot a very vulnerable target. 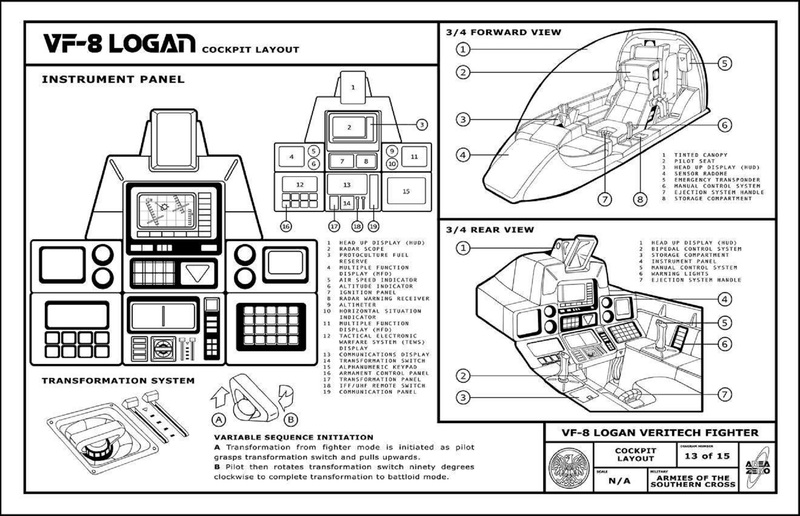 The Logan provides full protection from nuclear, biological, and chemical hazards, using an overpressure cockpit environment activated by radiation and hazardous chemical sensors, or manually when biological warfare conditions are anticipated. The internal consumables supplies can provide atmosphere for one day maximum. 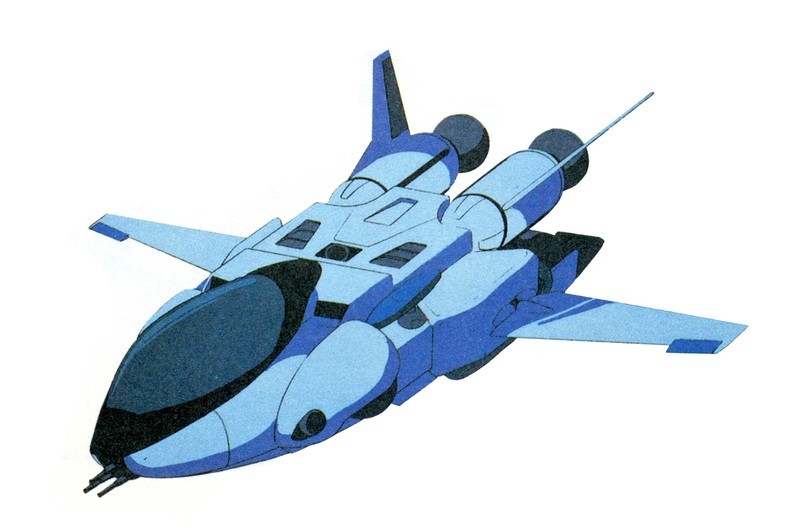 Following the First Robotech War, the UN Spacy decided that its future fighter fleet would consist of a high-low mix of Veritechs. This mix followed conventional pre-war thinking, best exemplified by the US Air Force’s F-15 Eagle, F-16 Fighting Falcon combination, and the Soviet Union’s mix of Su-27 Flankers and MiG-29 Fulcrums. 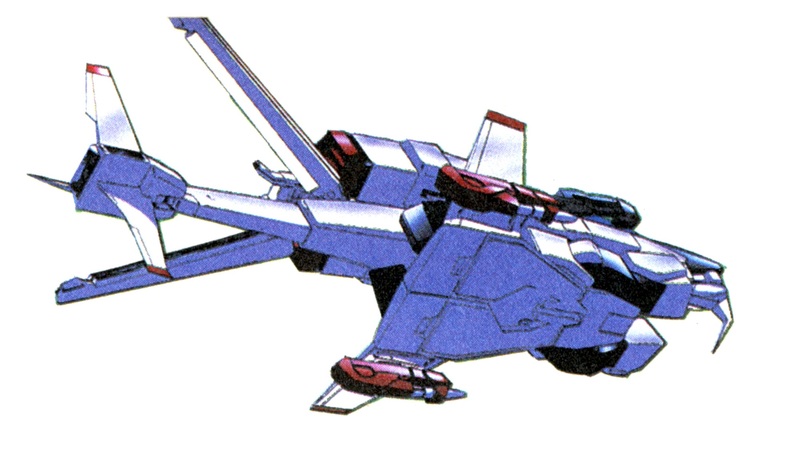 Originally, the intent was for the new VF-4 Lightning III to make up the high end of this equation, with the low end filled by the VF-1 Valkyrie. 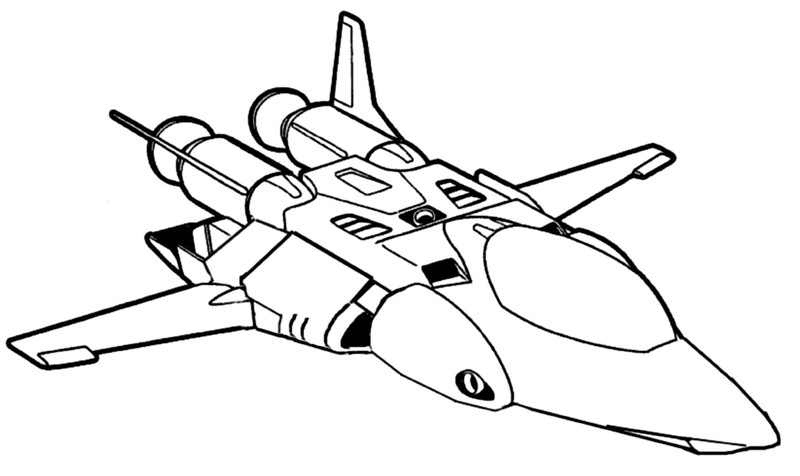 Eventually, the Valkyrie was to be replaced by a lower cost Veritech fighter. 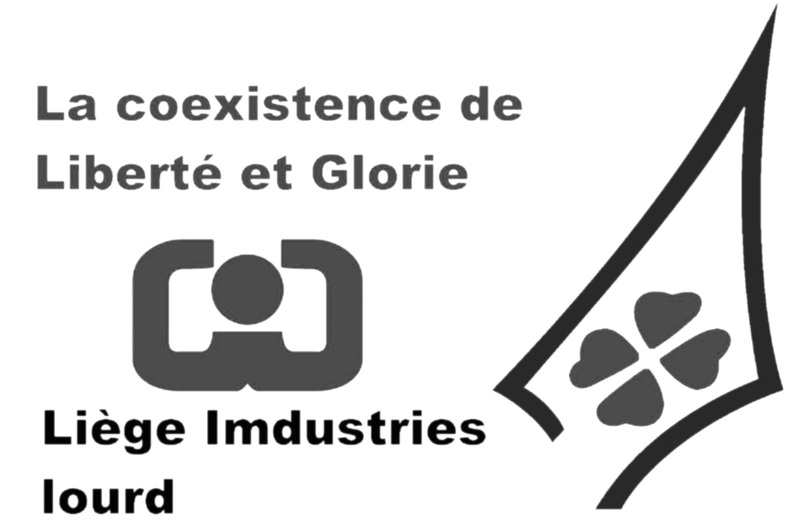 When the United Earth Defense Force (UEDF) and Reconnaissance Expeditionary Force (REF, later re-designated the United Earth Expeditionary Force) were formed, both of these branches decided to adopt the same high low mix concept. The search for a lower cost replacement for the Valkyrie featured two contenders: Northrop Grumman’s XVFA-8 Logan and Maxwell Dynamic’s VFA-X-5 Vector Multi-role Veritech Fighter. Maxwell Dynamics was a relative new comer to the defense industry, having been formed by visionary industrialist Donald Maxwell after the war. The Logan won the competition, due to a combination of lower price and Northrop Grumman’s established track record. The Vector, on the other hand, went on to be developed into the larger VQ-6 Vandal and VFA-6 Thunderbolt III/Alpha series of Veritech fighters. By the time the UEDF and the REF were organized in 2018, the Lightning III had proven itself to be a dismal failure. The fighter’s overly complicated design had led to reliability problems with the transformation sequence and severe airframe fatigue at earlier than expected flight hours. 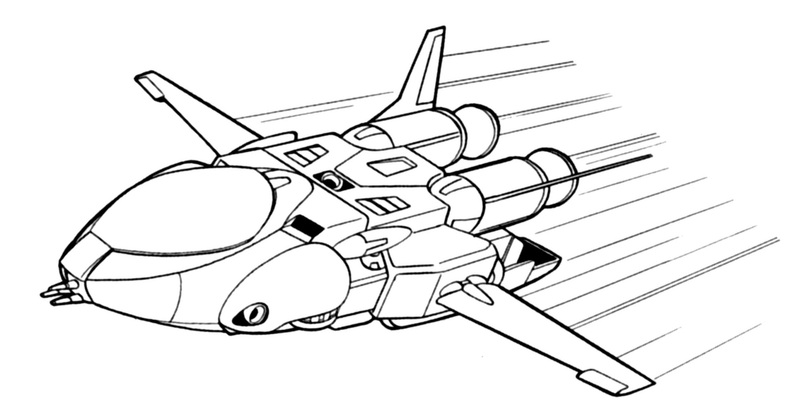 Because of these issues, the Lightning fleet spent most of its service life restricted to fighter mode. What was worse, the Lightning went way over budget. Fly away cost per unit bloomed by over three hundred percent. Production was cut short, leaving the UEDF and REF in a lurch. 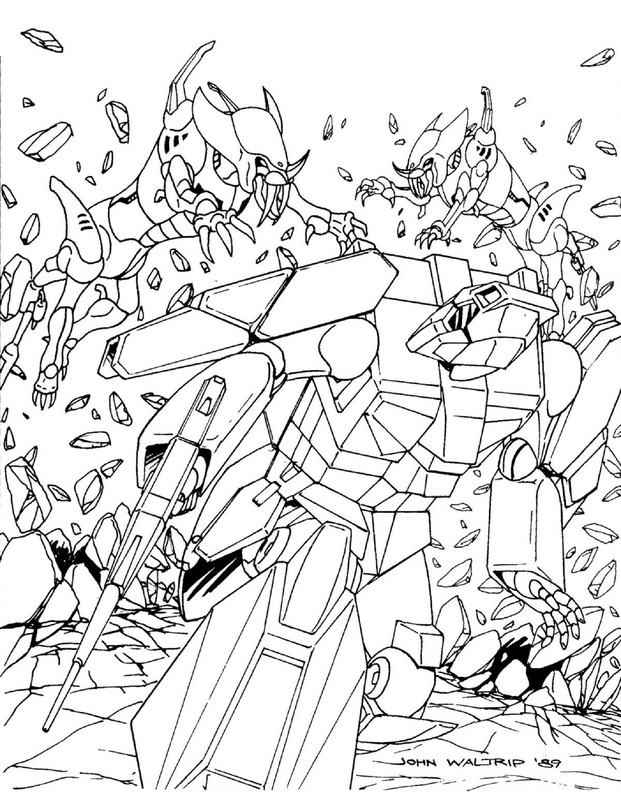 This situation caused the VF-1 Valkyrie’s production run to be extended, until a suitable “high-end” replacement could be found. The VFA-6 Alpha/VFB-9 Beta “Legioss” weapons system ended up being designated replacement, though the Beta half of the equation did not go into production until twenty years later. When the Pioneer Mission departed in 2022, both the UEDF and the REF had an eclectic mix of fighter aircraft. The REF launched with a combination of VFA-6 Thunderbolt IIIs, VFA-8 Logans, VF-1 Valkyries, VF-4 Lightning IIIs, FAV-105 Vixens and FA-101 Vultures. The UEDF, for its part, operated a much smaller fleet of the same Veritechs. While the bulk of their forces were made up of conventional fighters such as the AA-1 Tivar II, F-110 Falcon II, FA-109 Sylphid, FA-112 Chimera and FA-115 Pluto. In 2025, all VFA-8 Logans were laterally transferred from the REF to the UEDF. In exchange, all of the UEDF’s VFA-6 Thunderbolt IIIs were transferred to the Expeditionary Forces. The official reasoning behind this was that the Logan’s factories were Northrop Grumman’s facility on the moon and the Liège Industries Lourd plant in Belgium, whereas the Thunderbolt III’s were all built on the Robotech Factory Satellite, which was with the REF. This made it easier for both parties to be supplied with spares for their respective aircraft. By the late twenties, all VF-4 Lightning IIIs had been completely withdrawn from service. 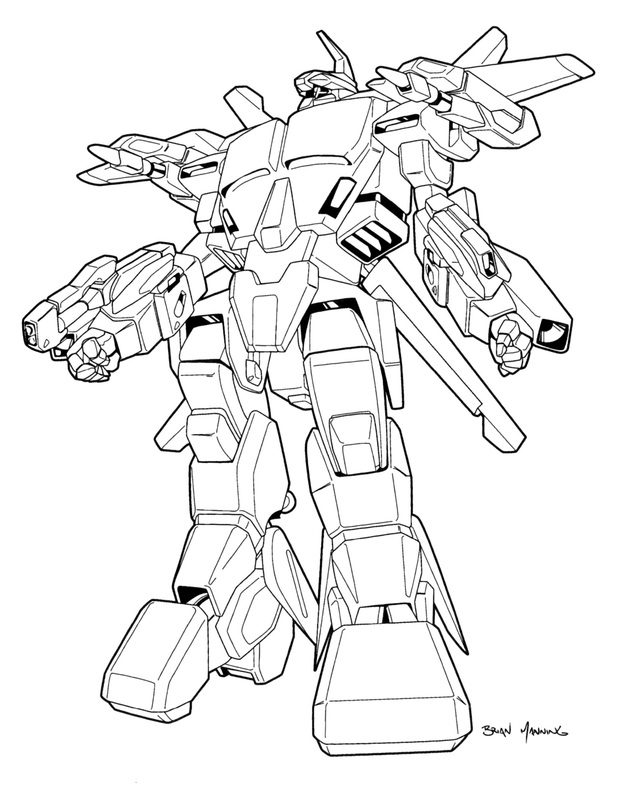 The VF-1 Valkyrie had been withdrawn from UEDF and REF service, but soldiered on in the Colonial Defense Forces. This left only the VFA-6 Thunderbolt III with the REF and the VFA-8 Logan with the UEDF. 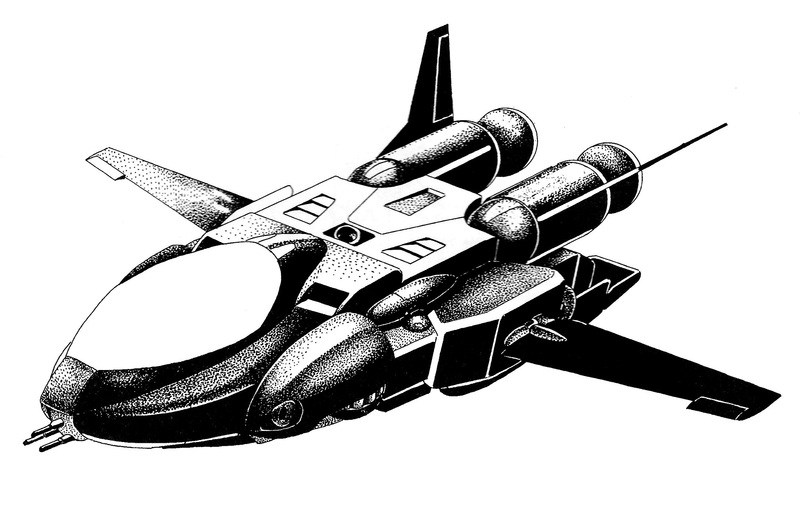 In 2026, the Tactical Armored Space Corps (TASC) began to replace thousands of the Tactical Space Corps’ (TSC) FA-115 Plutos with the Logan. When the Masters arrived in Earth space, the Logans were among the first mecha thrown into the fray, especially when one of the TASC’s ground bases was suddenly attacked by Bioroids. 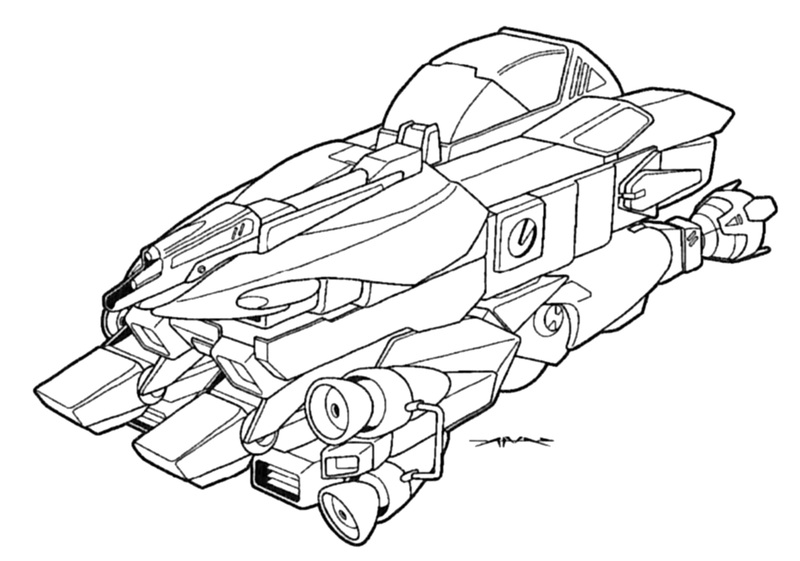 Unfortunately, the Masters’ tactics did not agree with the Logan; the Bioroids’ Hovercraft were not really meant to be aircraft, the Masters instead relying on their Assault Carriers to destroy any opposing airborne mecha before releasing the Bioroids. This meant that the Logan had to slug it out with the slow and heavily armored Bioroids on their terms, where the Logan was outmatched, or that they were used against the Assault Carriers, which were so superior that the Logans had neither speed nor firepower advantages. 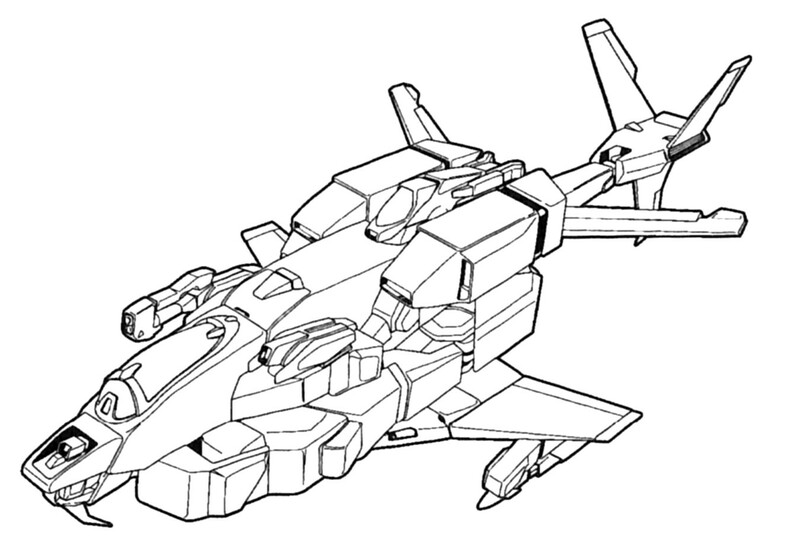 Quite soon in the war, the Logans were supplanted by the far more robust and versatile VFH-10 Auroran. The VFA-8 Logan was very small, barely 6.3 meters long. The small size meant a small target, but also left very little in the way of armor. 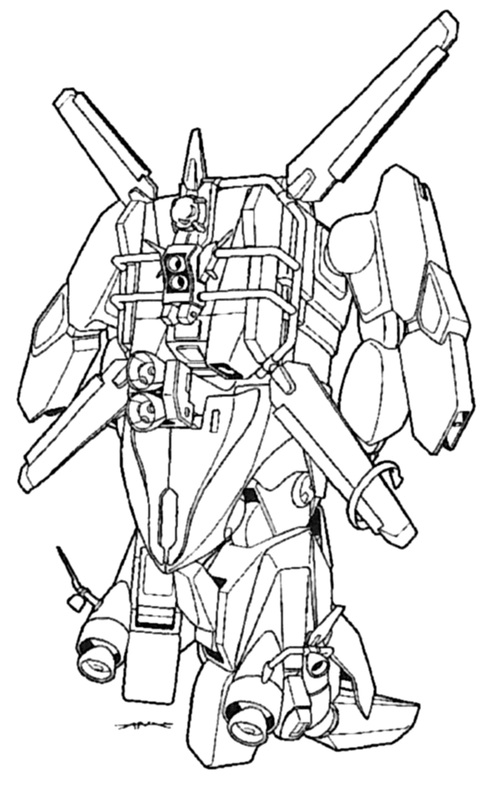 This fact and that of the exposed pilot’s compartment made the mecha somewhat unpopular with its pilots. 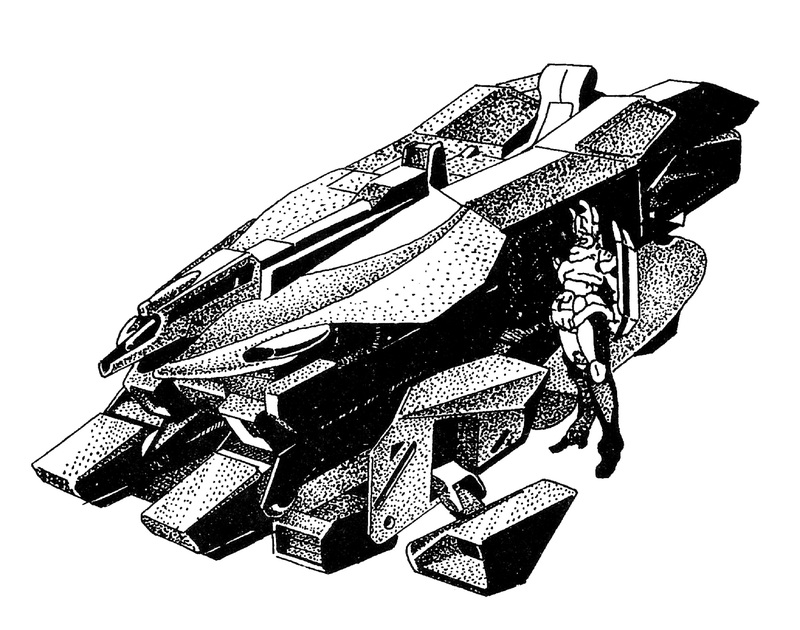 The large, high mounted conventionally constructed transparent canopy provided the pilot with excellent all around visibility, but left him exposed to both enemy fire and cosmic radiation. It was this which, in part, lead the UEDF to institute the practice of having all pilots wear personal flight armor in combat. In the Logan’s defense, it must be added that slugging it out with heavy mecha on the ground was not the tactic the Logan was designed for: the small size, coupled with the remarkably robust engines and power delivery system, made for a very nimble Veritech, and a notoriously difficult target. 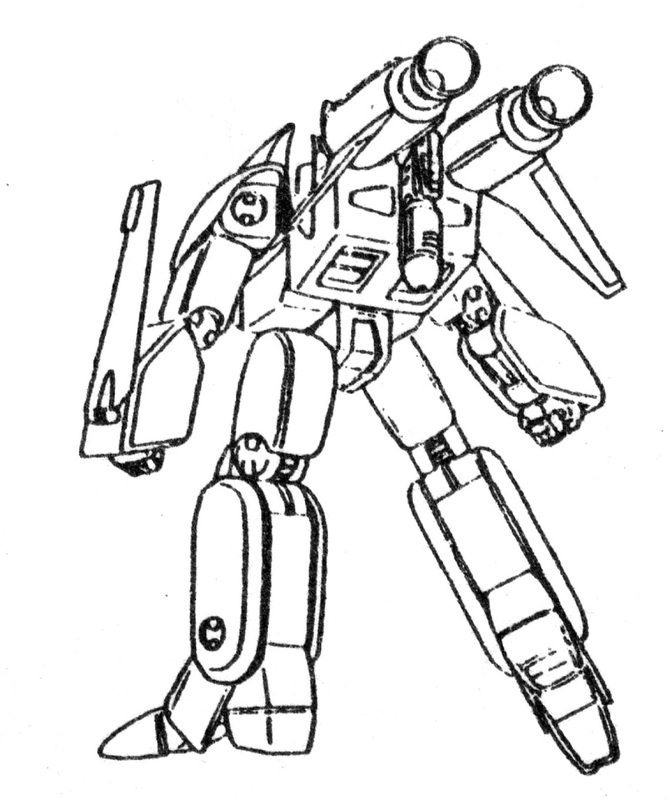 In the post war period, the Robotech Research Group developed their smaller protoculture energizers and engines. It now became possible to create a tiny (and hence agile) Veritech with a lethal energy weapons package and excellent engine performance. The Logan was equipped with 16 protoculture cells. Because of this, if all weapons were fired simultaneously, the Logan could deliver 23 MJ of energy on an opponent. 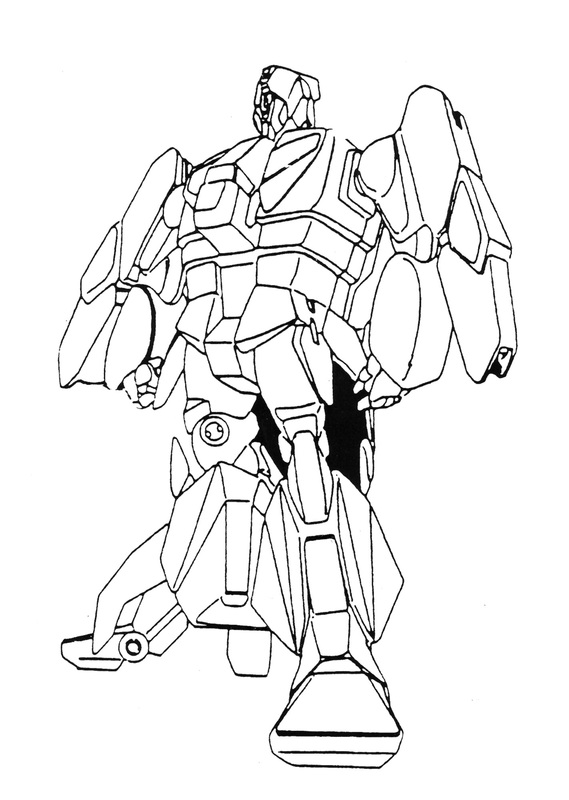 This was very lethal indeed and admirably suited for its design philosophy: to outfight mecha in space. Though the Logan was relatively slow in an atmosphere, because of its shape, the engines and boosters on this craft made it capable of tremendous accelerations, a significant advantage in combat, especially in the area of missile avoidance. Its shape and simple transformation sequence allowed a large amount of reaction mass tankage, substantially increasing the delta-v available. The Logan was a lifting body/winglet design. Most of the lift generated in atmospheric flight was provided by the fuselage. The lifting body help relieve some of the high wing loading on the relatively small winglets. With the combined lift from the wings and fuselage, the Logan had an unboosted service ceiling of around 10,000 meters. The Logan had a very high stall speed of 350 kph. This stall speed was mitigated by the fact that it was VTOL capable, what with the use of GERWALK mode. The high wing loading and resultant lack of air to air combat maneuverability was not considered to be a big issue, since the Logan was never meant to be an air supremacy fighter. Rather, the VFA-8 was designed for space supremacy and close air support (CAS) when operating within a planetary atmosphere. Only the later VFA-8N naval variant was meant for air to air combat, a role at which it did not particularly excel. The small wings incorporated two stage integrated flaperons with spoiler/speed brakes on the trailing edge, leading edge slats and vortex generators, which allowed for high angles of attack (AOA). The Logan made use of a modified Pelican type tail, which provided yaw and pitch control in atmosphere. 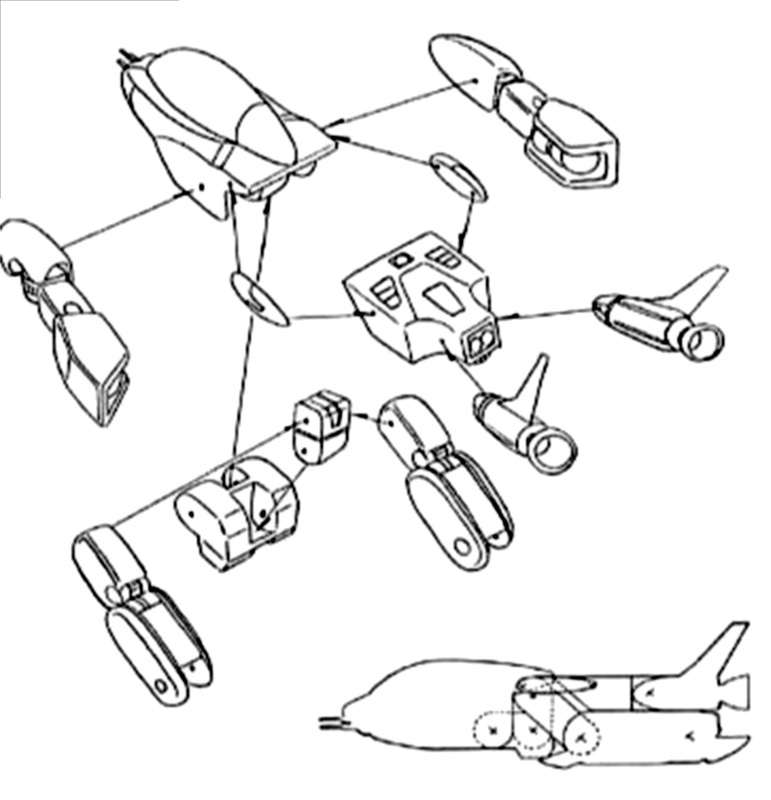 Various Vernier thrusters allowed for pitch, roll and rotation control in both space and atmospheric flight. The Logan was the first aircraft to introduce full fiber optic fly-by-light (FBL) controls. Though the Logan wasn’t a true “Dive Fighter” in the same sense as the VFA-6 Alpha, it was designed to enter a planetary atmosphere at high speeds. As on the Alpha, the Logan was not equipped with a miniaturized pin-point barrier (PPB) reentry system like that on the later aircraft like the VF-14 Omega. Rather, it made use of heat-resistant ceramic armor tiles in addition to the general heat resistance of the aircraft’s “space metal” skin. 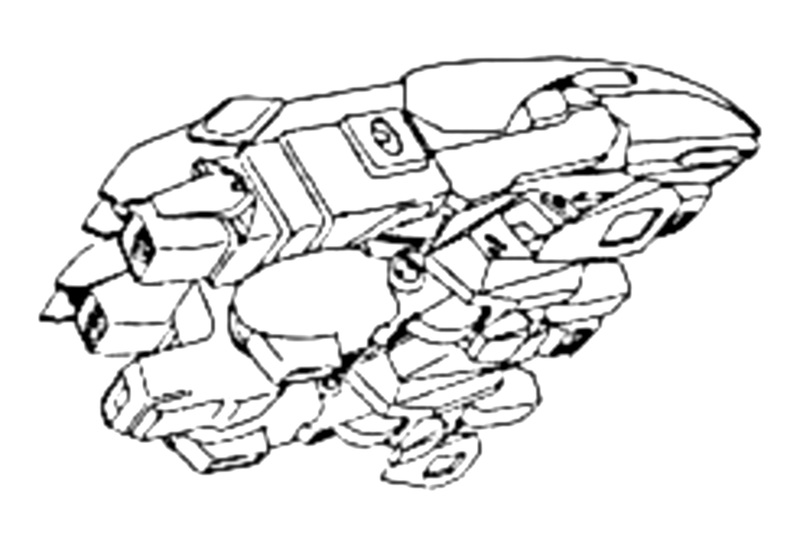 In addition to being highly heat, and thus projected energy weapon, resistant, this tile and skin combination provided resistance to up to 22.3mm Zentraedi armor piercing rounds. An interesting feature of the Logan was the “Smart Filler” system, which consisted of a polymer filler sandwiched between the tiles and skin. This filler would flow into and fill any breaches in the aircraft’s skin. This filler was highly heat resistant, and allowed for atmospheric reentry after sustaining heavy damage in combat. 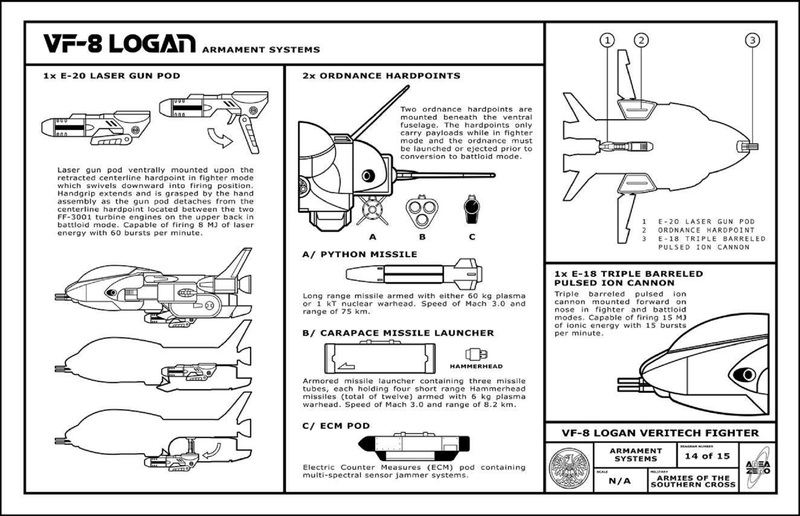 The Logan did not have the ability to attain low Earth orbit on its own. 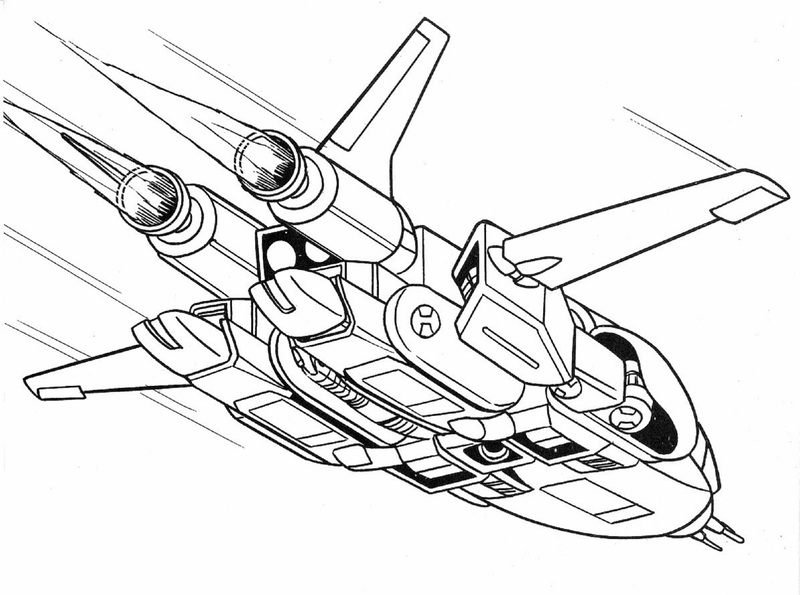 In order to be inserted into orbit, the Logan had the option of being attached to an SM-11B Skögul Atmospheric-Escape Booster (a development of the Valkyries booster) or it could be carried on a combat shuttle such as the AS-14 Pegasus cargo assault aerospace craft. 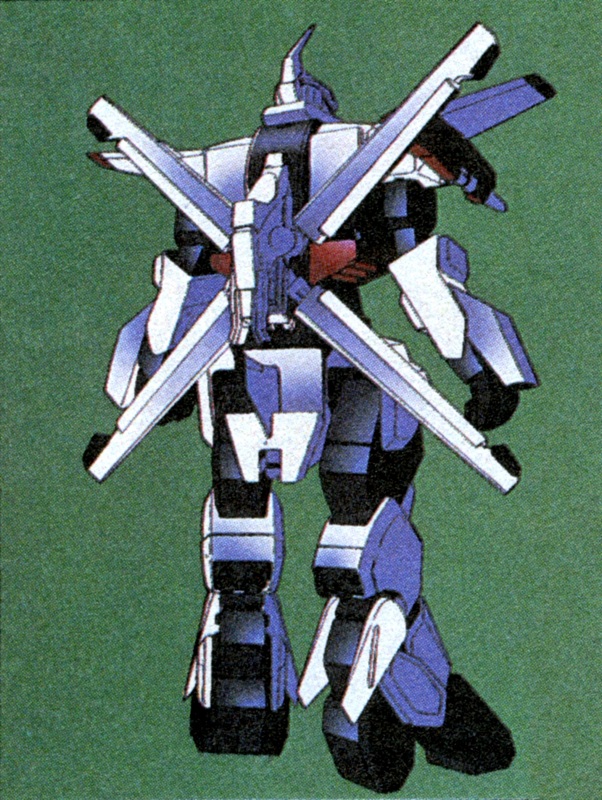 Though it was of no help in regards to atmospheric escape, the Logan was designed to use the version one and version two FAST Pack booster units, as utilized on the VF-1 Super Valkyrie. XVFA-8: Test and evaluation prototype. VFA-8A: The A model was the first production type. The Southern Cross purchased 382 aircraft, starting in 2018. The Reconnaissance Expeditionary Force (REF) fleet received 32 aircraft for preceding evaluation. VFA-8B: Expeditionary fleet variant. The VFA-8B introduced improved leg joints so that it could be launched and recovered from ships in GERWALK mode and improved engine durability. The B model also carried ten Hammerhead missiles internally. 728 aircraft were delivered before the Pioneer mission departed for Tirol. In 2025, all remaining VFA-8Bs were laterally transferred to the United Earth Defense Forces (UEDF). VT-8A: Two seat (side by side) non-combat capable Veritech trainer. The side by side configuration was chosen so as to avoid the change in the plane’s center of gravity that a more conventional tandem configuration would have caused. The UEDF acquired only 16 aircraft, while the Expeditionary fleet took delivery of 128 aircraft, which were later transferred to the UEDF in 2025. VF-8N Sea Logan: Single seat naval variant. The VF-8N Sea Logan (or Slogan, as it was commonly referred to by its crews) was designed to replace the aging VF-1 Valkyrie in Navy Corps service. The design changes included a longer, aerodynamic nose cone mounting a more powerful variant of the Lightning III’s Hughes APG-113 X-band pulse-Doppler phased array radar and a fixed Oerlikon LPW-20 triple-barreled 20mm plasma cannon. The air inlets were moved to the sides of the fuselage, allowing for improved engine performance in atmosphere. The tricycle undercarriage was strengthened for carrier operations, and incorporated a dual nose wheel with catapult launch capability. VFA-8C: The C variant introduced the Westinghouse APG-140 X-band pulse-doppler active phased array medium-range radar, improved Monument Propulsion Labs MPL-3001 fusion intermix turbines (replacing the MP-3000 engines) and a widened cockpit to accommodate a pilot wearing personal flight armor or hostile environment armor. 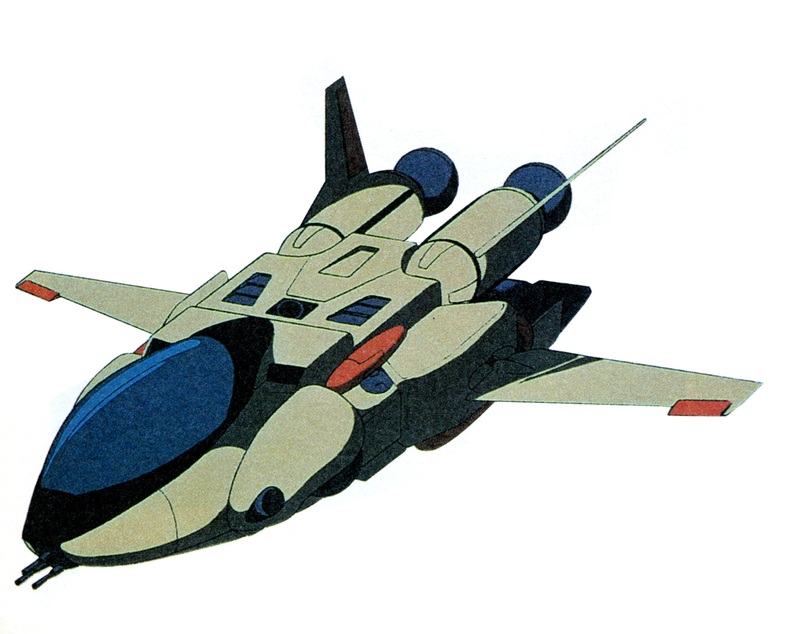 By the outbreak of the Second Robotech War, all VFA-8A and B Logans had been upgraded to C standard. 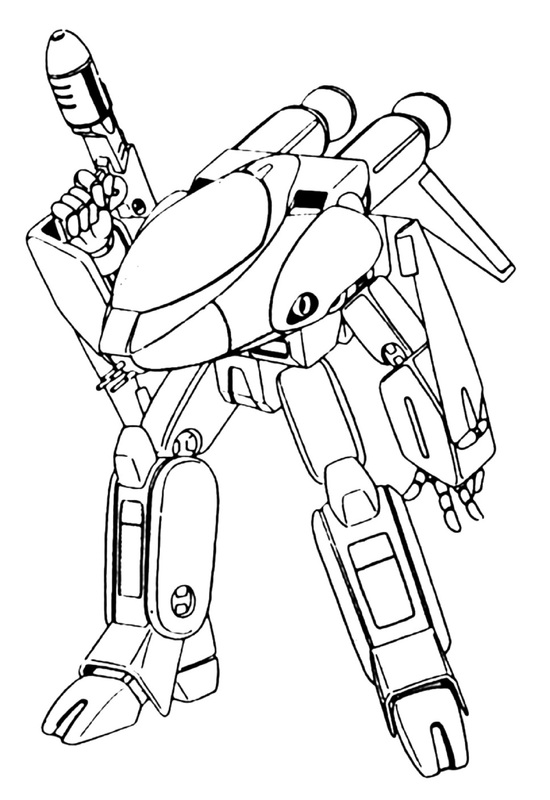 VF-8D: The VF-8C was a proposed variant of the VF-8N intended for use by the Tactical Air Force (TAC). The specifications were essentially the same as the Sea Logan, save for the landing gear which was the same as on all other Logans. VF-8NB Sea Logan: The NB Sea Logan incorporated the same upgrades as the VFA-8C, with the exception of the radar system.